This post is addressed to all my fellow artists and friends of the art world. Several days ago I heard dreadful news regarding a fire at St.Michael’s Studio, Bridport, Dorset DT6 3RR. A dear friend of mine, brilliant artist, and Past President of the Society of Graphic Fine Art, David Brooke, and his wife Caroline have a studio on the second floor. They still cannot get in to view the damage as it’s unsafe, but fear they have lost everything. Illustrator Paul Blow and his partner had a studio on the top floor and have lost a life’s work. We can all imagine what a ghastly blow it would be if we were in their situation. A fund has been set-up to help the St.Michael’s Artists If you would like to help by contributing the details for a bacs payment is below. I do know anything you can give would be hugely appreciated. 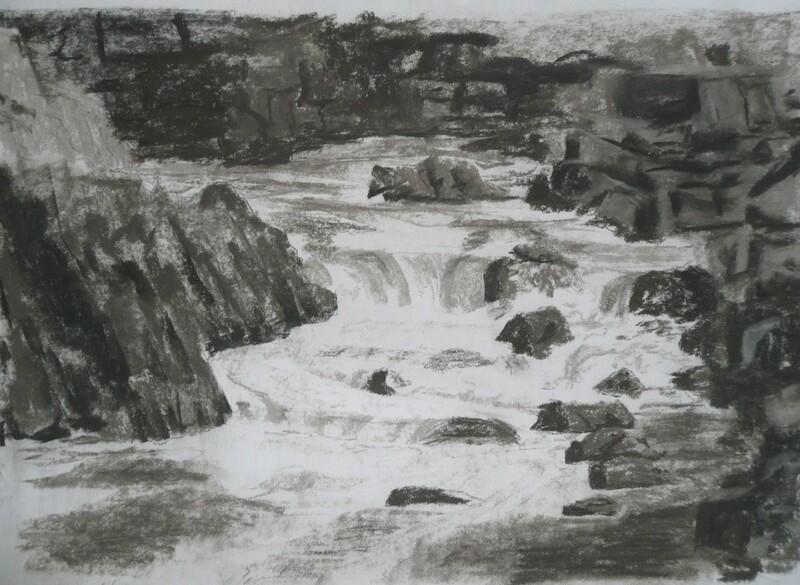 This post showcases work in charcoal and pastel, produced over five Tuesday mornings by a group I felt very privileged to teach at Norden Farm Centre for the Arts, Maidenhead. 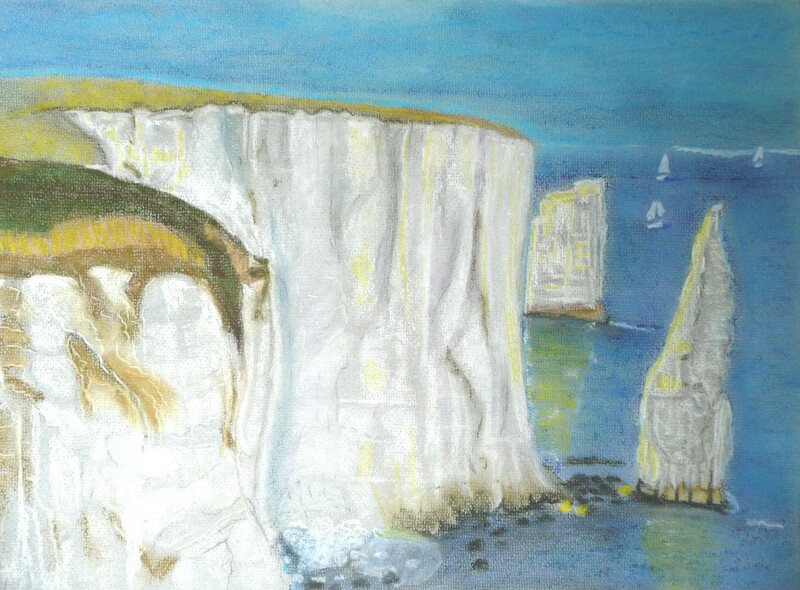 Many thanks to everyone for giving permission for me to show their work on my blog. 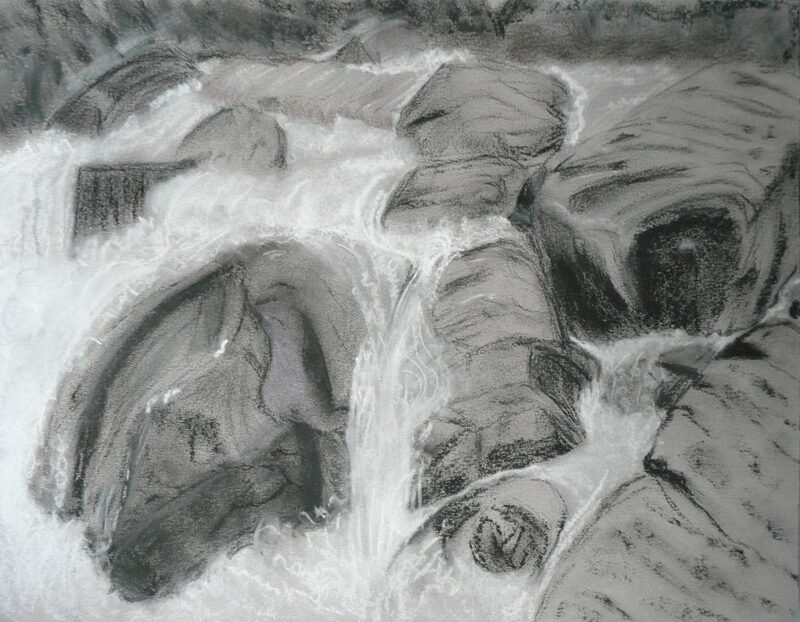 Focusing on depicting the character of rock formations we also sought to show the energy and force of water flowing over and around them. Some already had good drawing skills and colour was more of a challenge, especially for those more accustomed to mixing liquid paint. 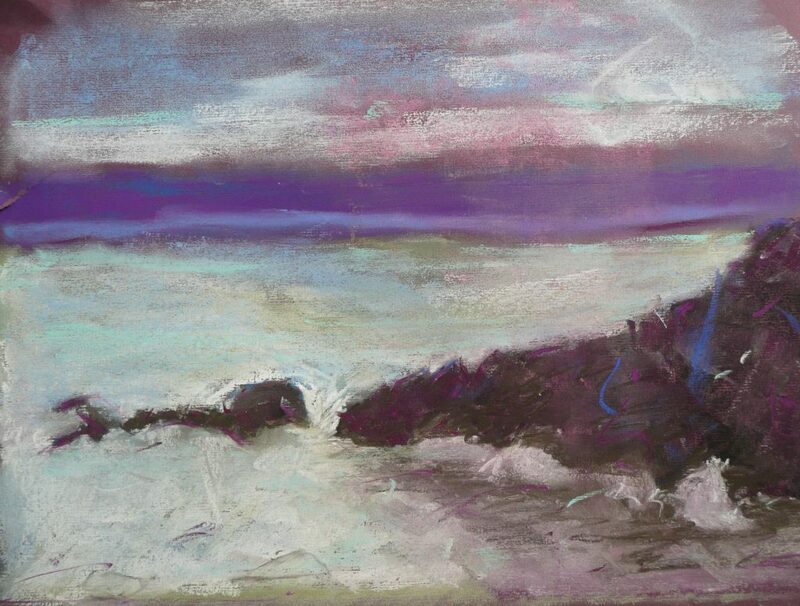 The painting above was made using a very limited palette and I think even the artist was surprised at the way a very pale green and a rather purplish magenta could make lilac greys in the sky and sea. 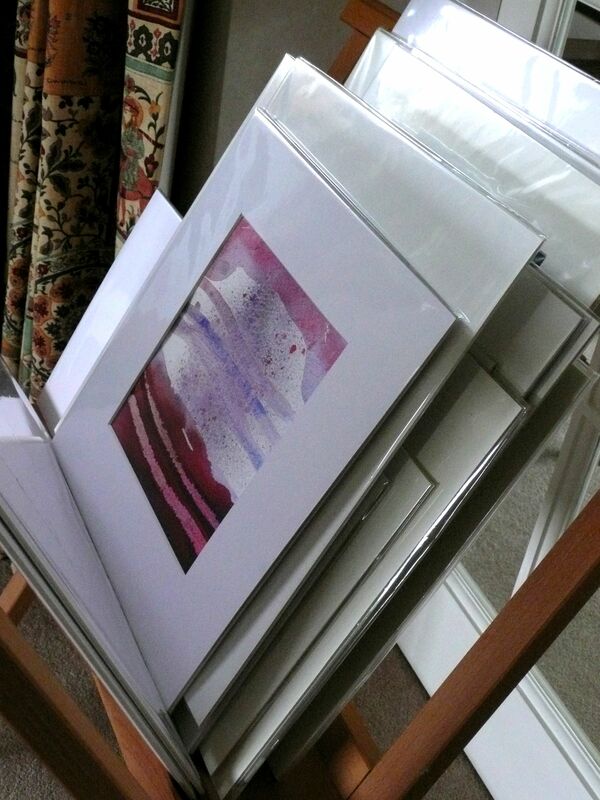 Papers used varied from Pastelmat to Fabriano Tiziano, Murano, and Ingres in many different colours. That’s enough words. here are the pictures! Unfinished but a great use of orange paper! Recently I was invited to trial a starter set of 18 Posca Paint pens. Not having used these paint markers before and not being at all used to working with marker pens, my experiments were a bit of a voyage of discovery. I liked the little caddy that contained the pens. Once the wrappers were off it was easy to get the pens primed to flow. Great to have all the nib sizes but nearly panicked when I found there was no brown, no grey, no dark red and no ochre or yellow green. This was more than compensated for by the silver and gold and the inclusion of three brush pens. The brush pens were great although only gold has been used so far. Glad the pump button at the end of the brush pen has a shield so that it can’t be depressed by accident if the cap for that end of the brush is left off. My first test was to scribble with the pens to find out their colours, covering capacity, and to get used to the ink flow on cheap copier paper. Then I looked at the blending possibilities on a sample of 300gsm Saunders Waterford hot pressed paper and a much rougher sienna coloured Fabriano Tiziano which I sometimes use for pastel. Blending was very limited on both as the ink sank into the paper. Also in the case of the Fabriano paper especially, the pens damaged the paper surface when I tried to blend before the paint dried. 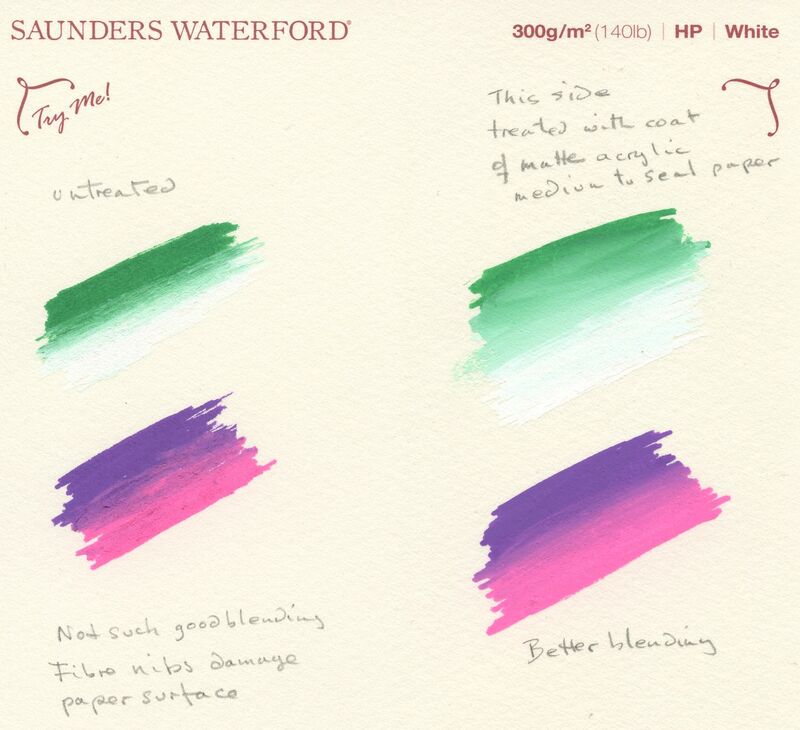 By coating the paper with matte acrylic medium I achieved much better blending results as the medium provided a non-porous surface so that the paint did not sink into the paper and remained wet just long enough for limited blending. 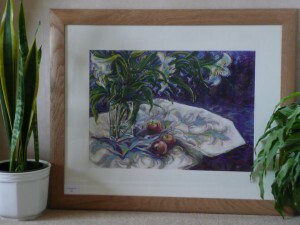 The medium dries clear so that the colour of the paper still shows through. So with a relatively rough paper, treating to give a non-porous surface is essential. After that I tried some layering of colours choosing a dark green off-cut of mount board. No attempt to blend was made but tests on a tiny piece suggested it had a smooth and relatively non-porous surface to work on. First of all I established the large tree trunks with the broad chisel pen followed by blocking in the sky with the white chisel pen. After that I scribbled some light blue into the sky. Next the tree branches were marked out with the smaller chisel shaped black pen using its broad and narrow nib edges to get some variation into the branch widths; see detail at top of post. 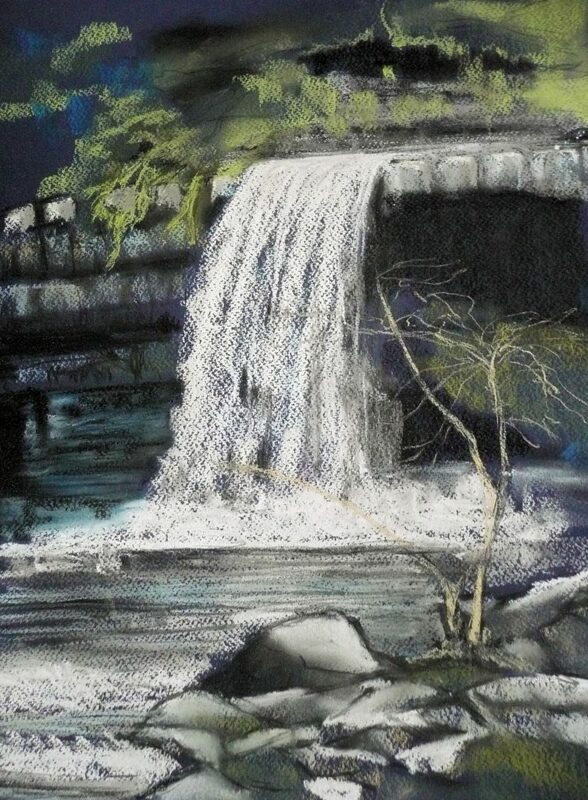 Finally all the colours and bullet shaped nibs were scribbled over the top to suggest the waterfall and foliage. I called the piece Graffiti Spring! 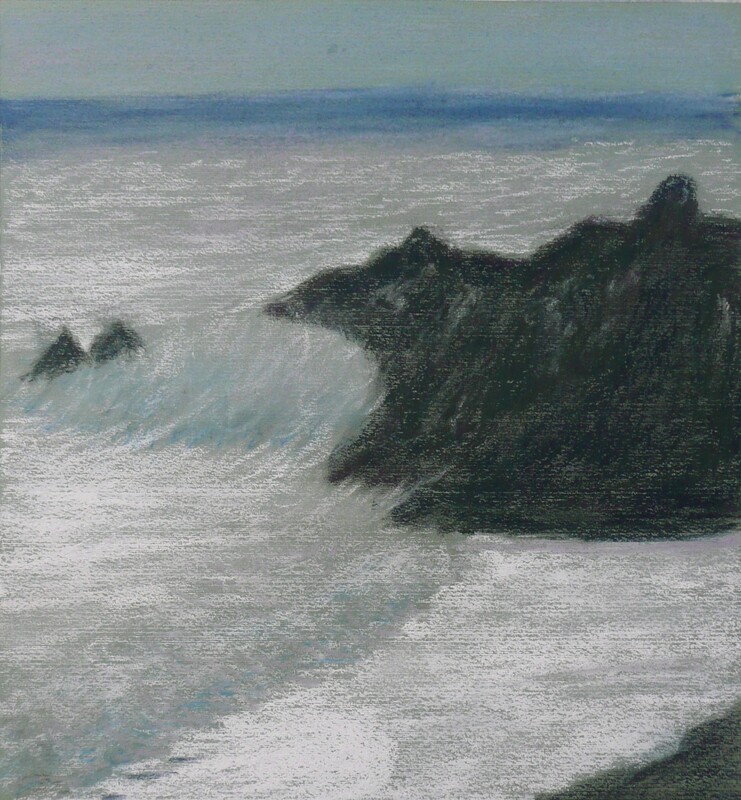 I chose a smooth very dark blue Canford paper obtained from Cass Art for the next two drawings, which when tested accepted layers of colour with no damage to the paper. 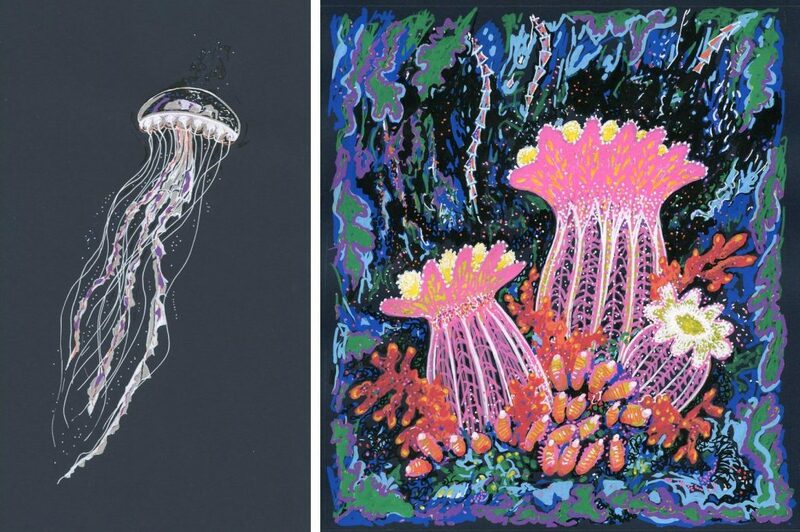 The first was a jelly fish made with the finer nibs and the second a cartoon style image of sea anemones. I did long for a transparent colour to wash over the pens to make the image more 3-dimensional but may do this at a later stage with acrylic paint. For my next drawing I decided to work from a sketch made on 22nd August at the current ‘Matisse in the Studio’ exhibition at the RA. 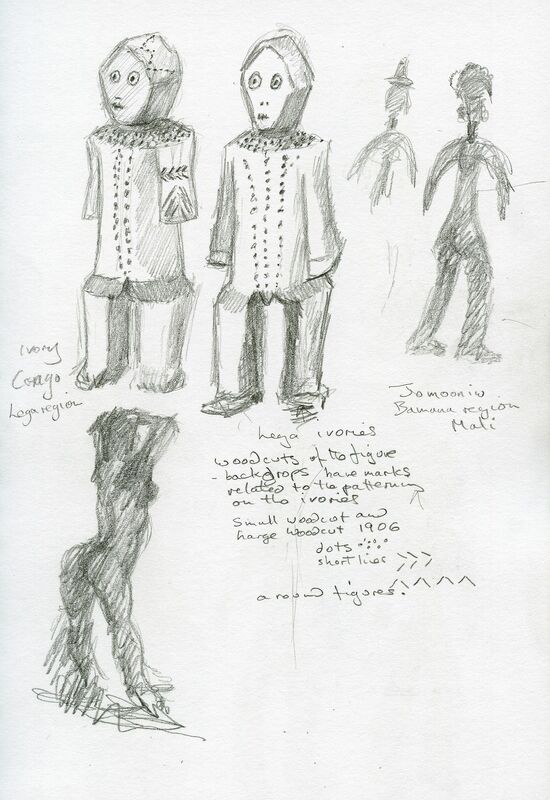 I was amused by two little ivory figures from the Lega region of the Congo. 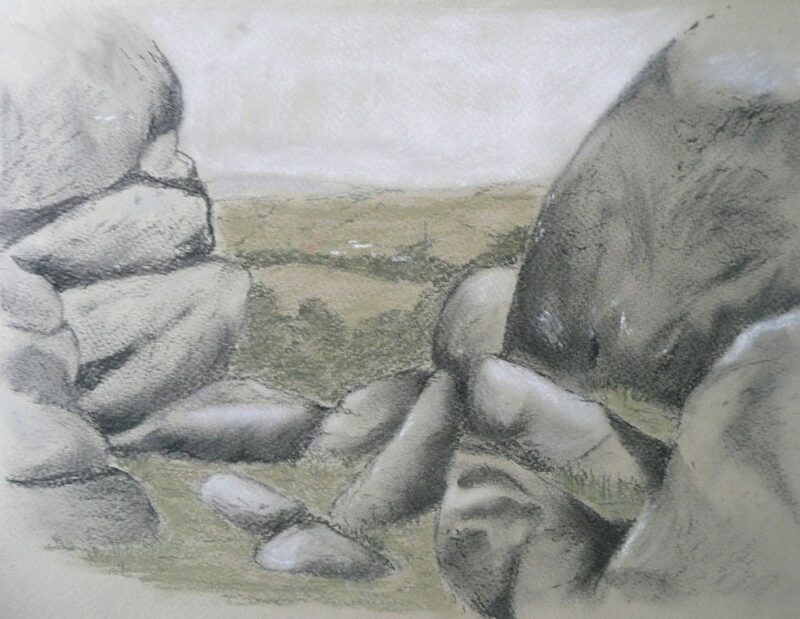 The drawing was made on the same Canford paper but in brown. One half was coated with a layer of black using the broad chisel pen. 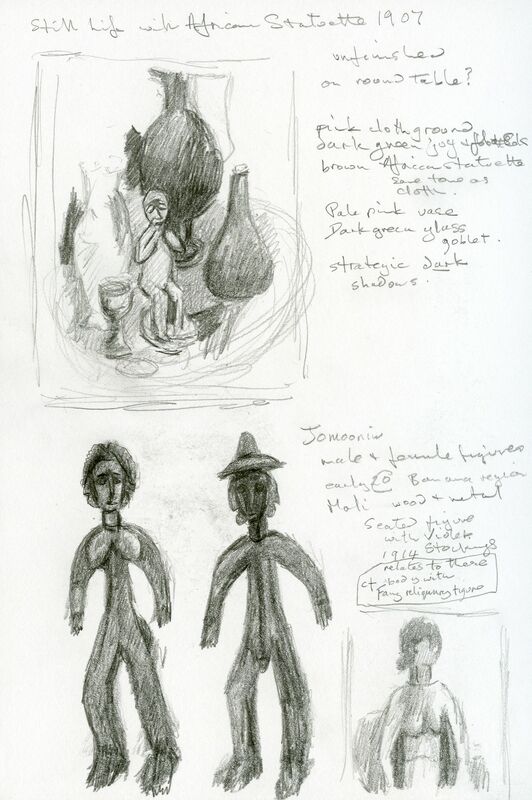 The figures were then drawn in white and shadow areas of the figures indicated with the fine silver pen and a touch of light blue. Outlines and markings were added with black and finally a tiny amount of Burnt umber watercolour used to ‘tidy up’ the figure on the right. The title is Waiting for Matisse. 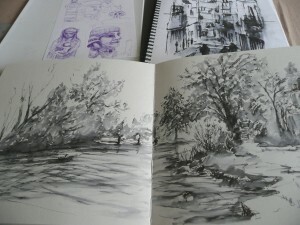 For this I returned to comparing paper coated with a layer of matte acrylic medium with untreated paper. 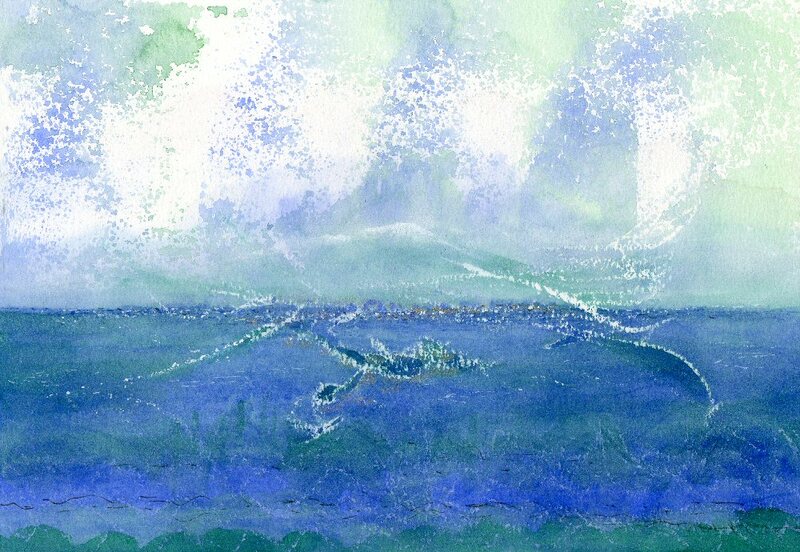 First I tried looking at drawing into wet with blue and green medium bullet tips on Sienna coloured Fabriano Tiziano paper. The untreated paper below was washed with water and the pens applied to the surface producing some beautiful feathery lines needing a light touch not to damage the paper. Successful ‘dropping in’ of subsequent colour required adding more water. 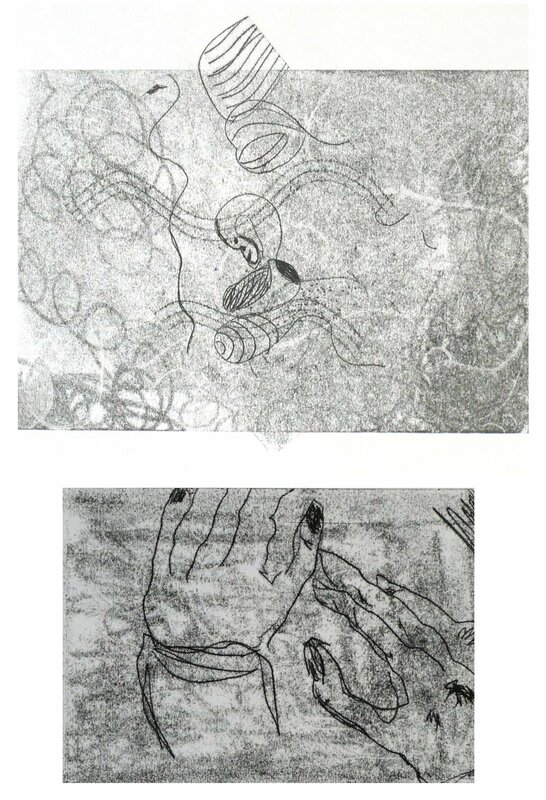 Washing a similar paper that had been treated with acrylic medium, see below, resulted in an almost uncontrollable wash of ink from the pen and dropping in could be achieved as the paper dried. Interesting back runs could be made and as the paint dried, in places the white chalk that makes the ink/paint opaque separated out, again making an interesting result that could be harnessed for future art works. Finally I made some more experiments working into white wet paper. 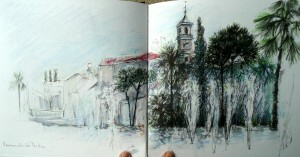 All were on an inexpensive NOT paper, Fabriano Accademia weight 260gsm. In the first trial on untreated paper, I wetted the surface then applied lines of pigment. This was followed by dropping in more pigment, rewetting the paper when required, and finally when the surface was dry, working more colour on to the paper. Sadly even the initial lines badly damaged the paper. I then made further trials by coating the same paper with matte acrylic medium as before and enjoyed controlling the washes and dropping in more paint. 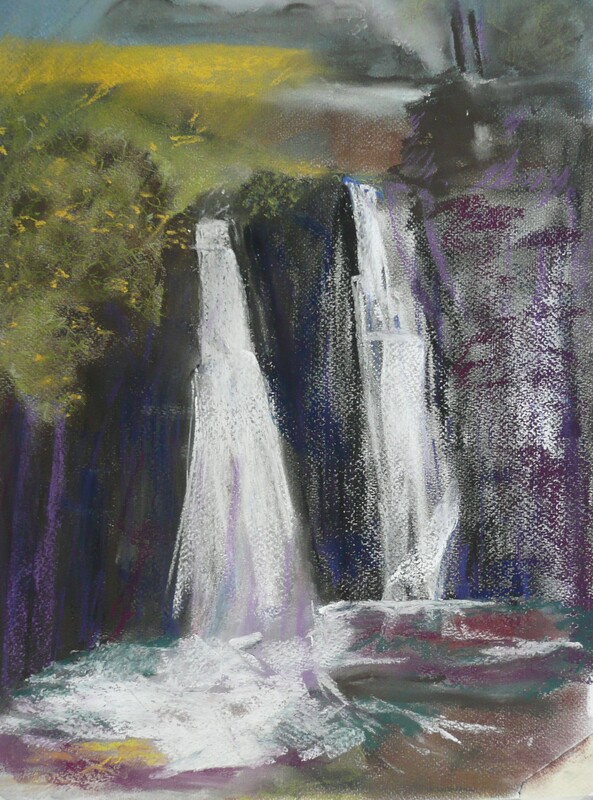 The large pink drops were added when the paper was still damp. The tiny pink and black dots black edges and little black square were added once the paper had dried. My final experiment combined layering and working on wet paper. The same white paper treated with matte medium was used. It was nearly a total disaster as I failed to control my overly wet washes. 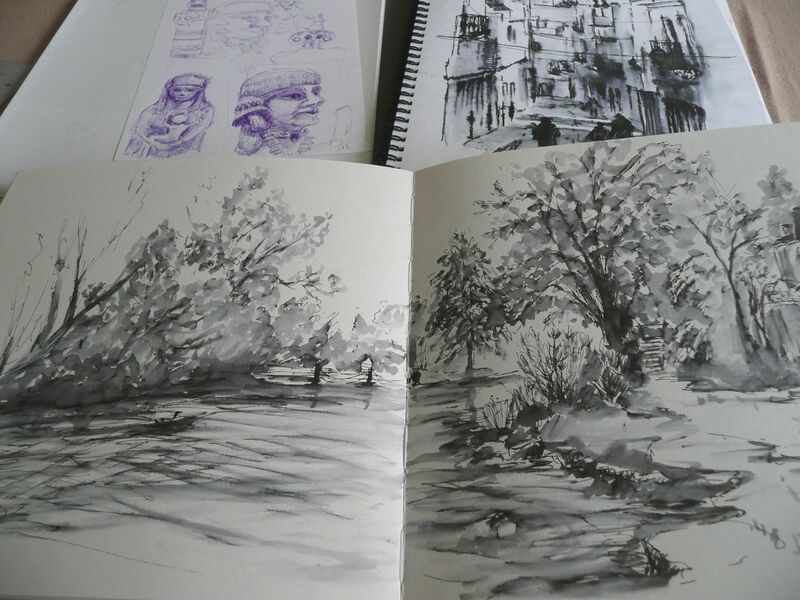 It was then the fact that I could wait for the paper to dry, select the areas I liked and overlay the rest with solid colour that I began to realise the merit of the good covering capacity of the pens. I coated the areas to be eliminated with the gold brush pen and then blocked in the large leaf with the blue pen. Then with the green, red, pink and ultrafine black pens I completed the line work. I thoroughly enjoyed testing the pens. I found it quite a challenge working with a limited palette and think some of the other colours, especially a grey pen, would have been useful; I just used silver instead. However I did appreciate the different nib shapes and sizes and love the gold brush pen. The brush was well pointed and kept its shape even after being closed and opened several times. 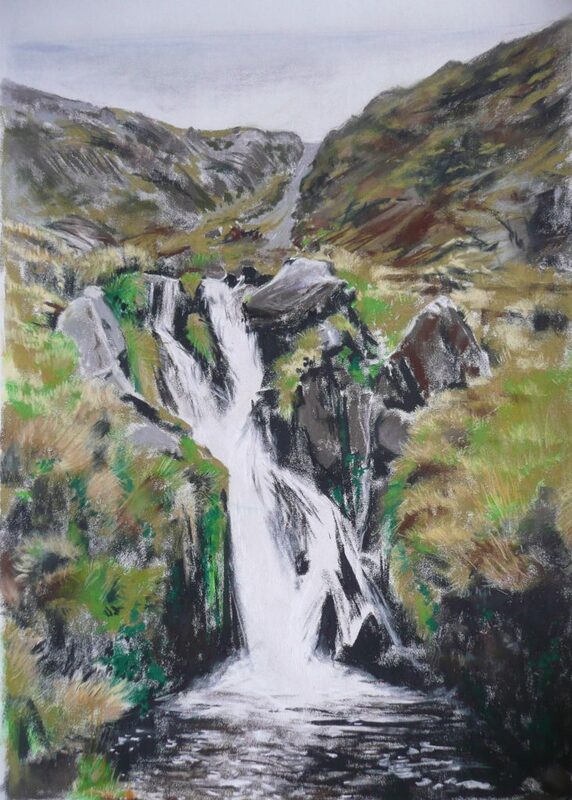 Looking forward, perhaps a limited range of transparent colours would be useful to add subtleties of tone. 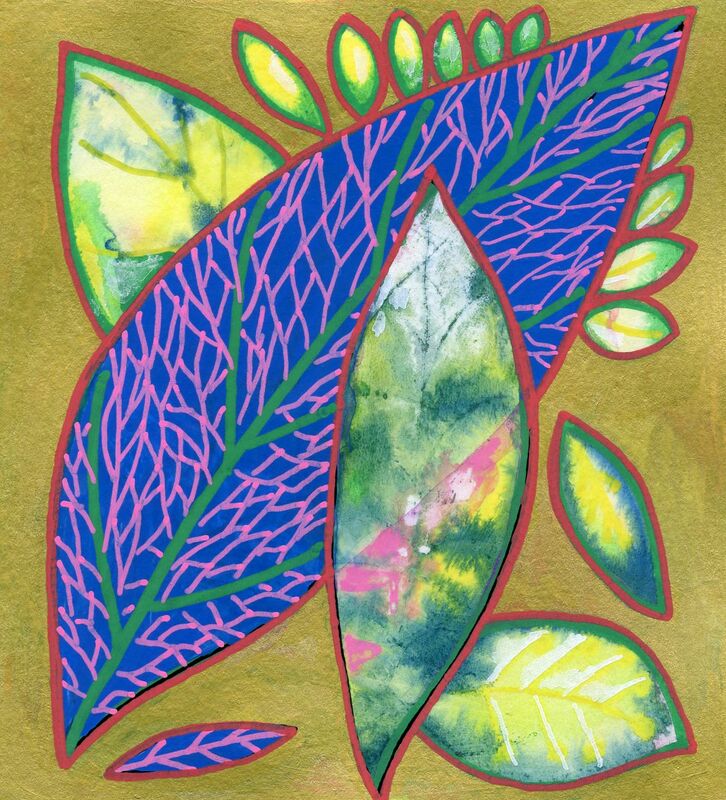 Because I use a large range of papers for my own work and for teaching, trialling Posca pens on different paper surfaces, wet and dry, was of special interest. I learnt a great deal about a medium I might not have used at all and will certainly be using the pens in future, so I’m grateful to SAA and Posca for the opportunity. When I make time I am looking forward to trying them on other surfaces, especially wood and stone, besides incorporating Posca paint pens into mixed media works. 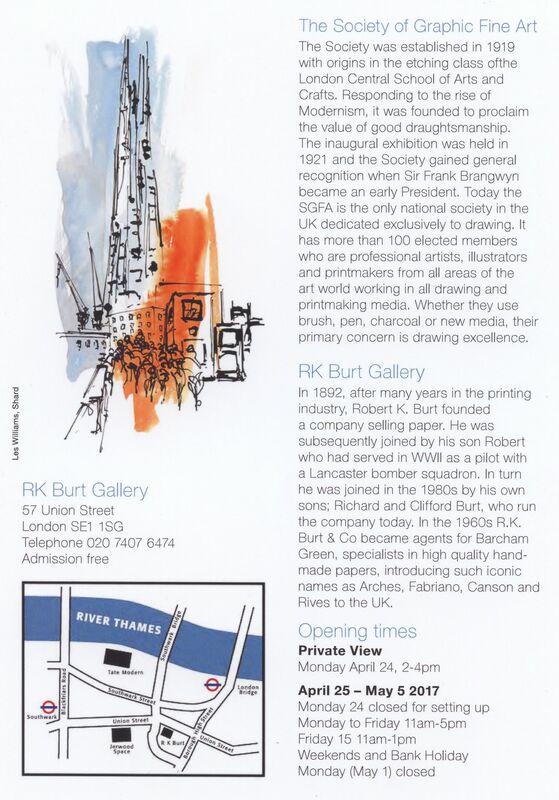 Jo feels very privileged to be taking part in the Society of Graphic Fine Art’s first London Members’ show for this year, at the R K Burt Gallery in Southwark. The exhibition will showcase drawing in many media including printmaking, and all details are on the invitation below. 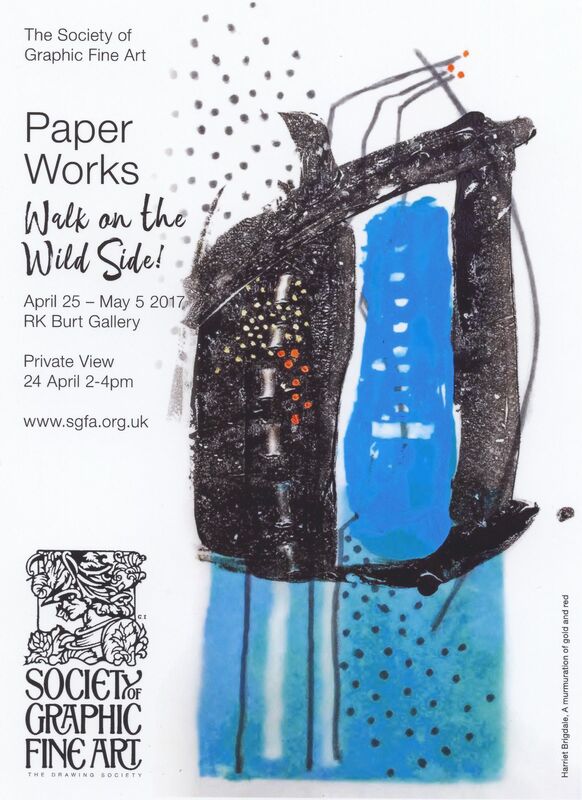 Hope you will be able to visit this delightful exhibition of works on paper where “Wild” will be very broadly interpreted. I love museums and drawing in them. They allow me to travel in time and space. 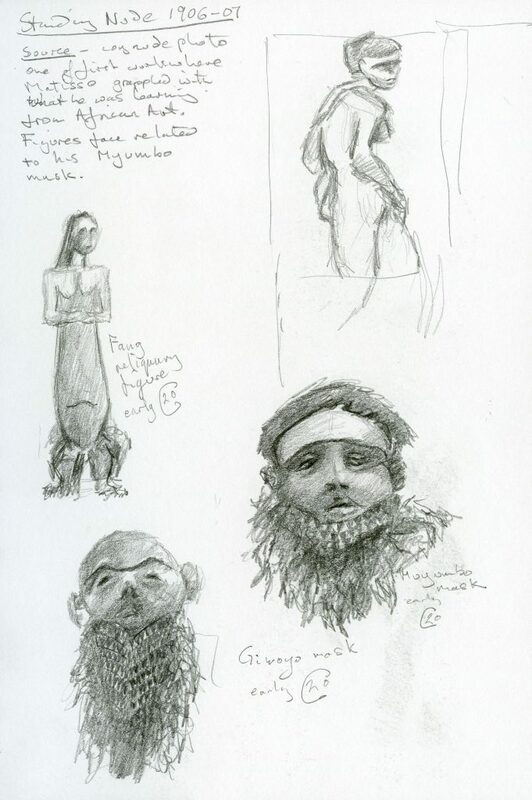 I’ve just revisited the Ice Age from drawings made in the British Museum in 2013 at Ice Age Art: Arrival of the modern mind. 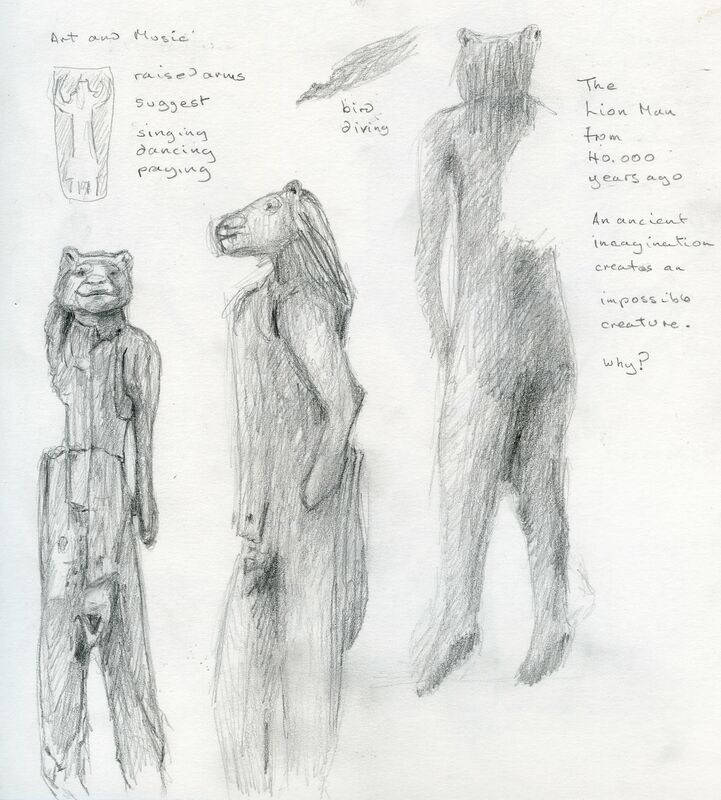 My sketchbook included drawings of the Lion Man sculpture made 40.000 years ago. Mind blowing to find man not only had the imagination to ponder such an impossible beast but could already translate his thought into a tangible sculpture. Deciding to make a more considered study in mixed media, I redrew the sketches of the lion man with a mid toned pastel pencil then made a dry wash of pale blue pastel over most of the sheet and began building up with more layers of pastel and soft pastel sticks. 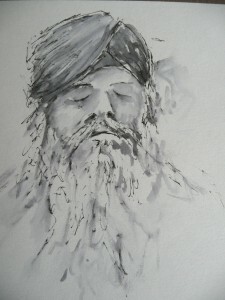 After that I knew a dark background was needed and diluted India ink was laid in with a brush. 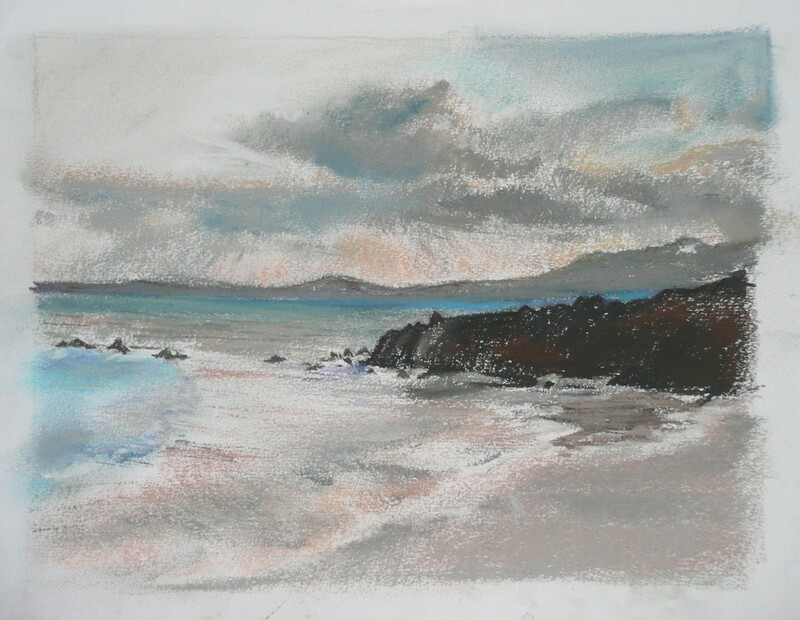 The pastel acted as a resist in places and I liked the effect and added another layer of ink, being careful not to lose all of the resist qualities of the pastel. 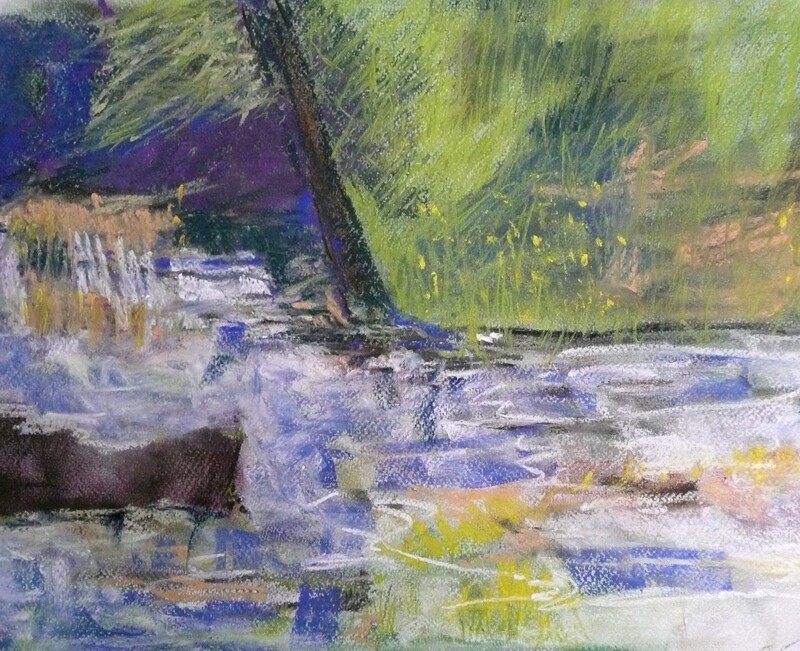 More pastel pencil was applied and the background enriched with transparent watercolour in tiny strokes of Alizarin, ultramarine and Prussian blue. Further lines were added with pen, pastel pencil and gouache, and finally a few washes of Alizarin around the legs. The figure in back view developed a softness suggesting a metamorphosis from wood to flesh. I had no hesitation in retaining this, and hence the title Becoming Human, suggested itself. 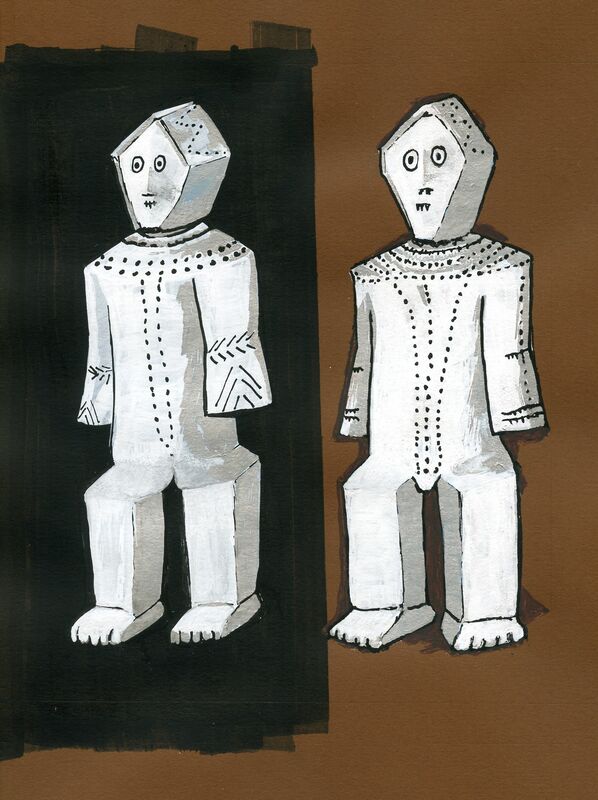 Earlier this year I returned to the British Museum, this time to visit the African galleries and drew a curious construction, mainly of painted wood and metal, a sculpture of separate parts screwed to a central pillar. 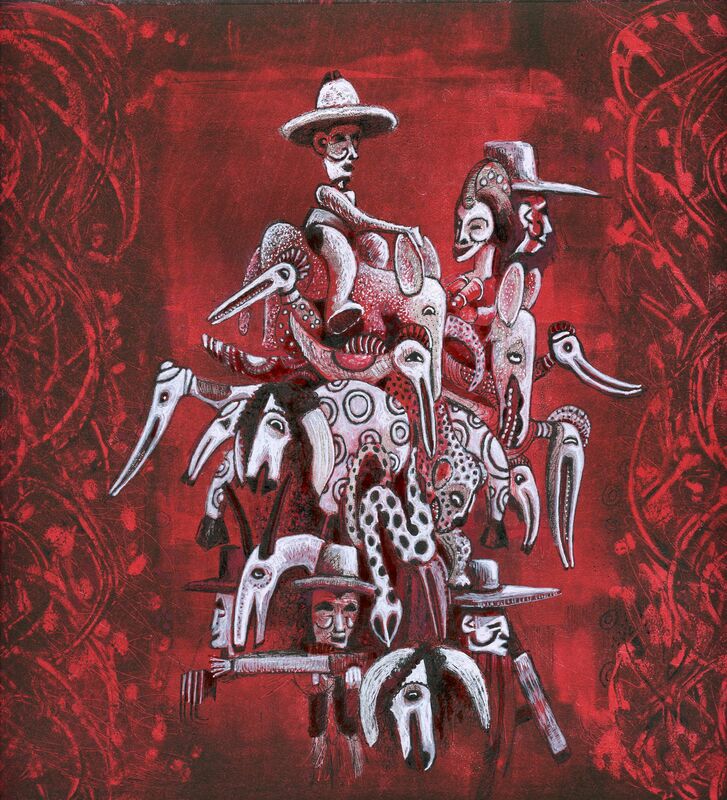 This was Igbo Nigerian and twentieth century, full of symbols of power and wealth; guns, European hats, horses, wild animals and equally wild face paint. It did appear slightly menacing but at the same time celebratory so it did not surprise me to find this sculpture and similar ones are used as rallying points for dancing. The colours used were white, terracotta, ochre, blue and black. 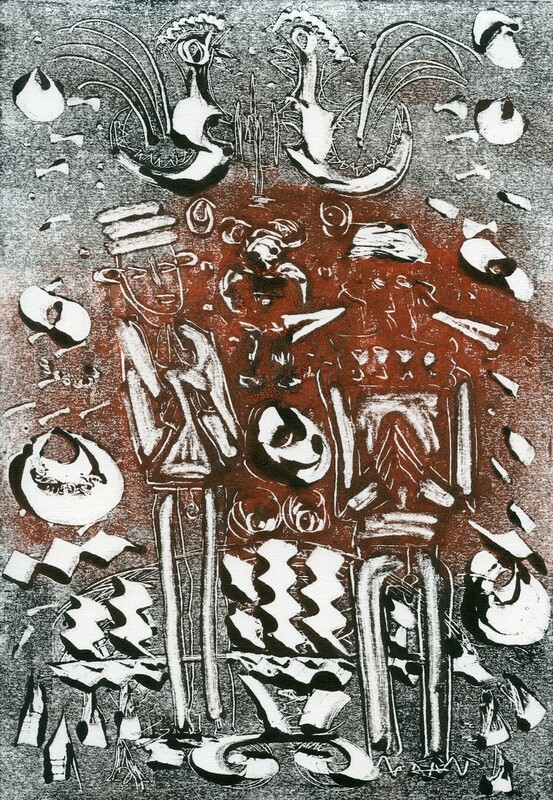 To develop a work for exhibition I chose to reverse the drawing and simplify the colour using black and white pigment pens over a two plate mono-print which provided a rich red backdrop. The guns and wild animals suggested hunting, and together with the other symbols of power the title Trophies was born. It was only today when I looked up the images on the British Museum site that I found on part of the construction I could not see, a baby was presented, so perhaps I should return to make a friendlier, family version. Alternatively, it could be that the birth of a healthy child is another symbol of power as the continuation of the dynasty is assured. As ever the history bound into objects is fascinating and I am curious to find out more. Becoming Human and Trophies are two works Jo will be showing at a Society of Graphic Fine Art’s Members’ show Walk on the Wild Side at the R K Burt Gallery in Union Street, London, 25thApril to 5thMay. 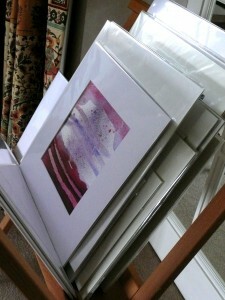 It was such fun to be taking part in the Cookham and Maidenhead Arts Trail, in CAMAT’s third year. 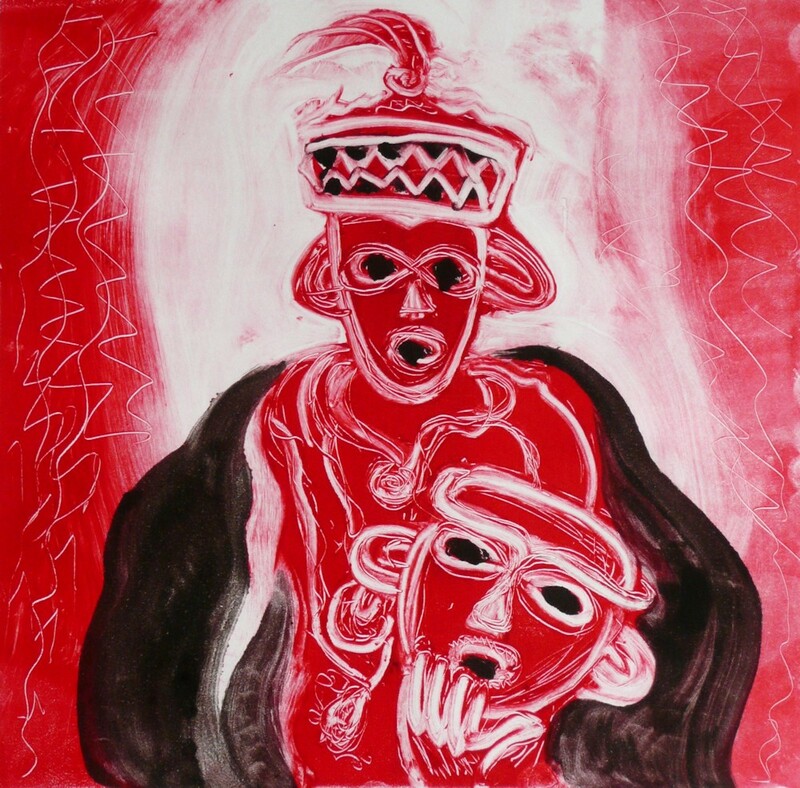 CAMAT showcases many different genres of local creativity from textiles and ceramics to painting and printmaking. My contribution was a show of paintings of London and the Yorkshire landscape, together with more experimental drawings and prints, and plate lithographs derived from museum drawing mixed with a little imagination. A selection of sketchbook drawings made in Spain, Nice, the Thames, the British Museum and on trains were also displayed. Part of the fun or challenge was hanging the works in a non-gallery space. My studio is not suitable so I use the living space of my home. 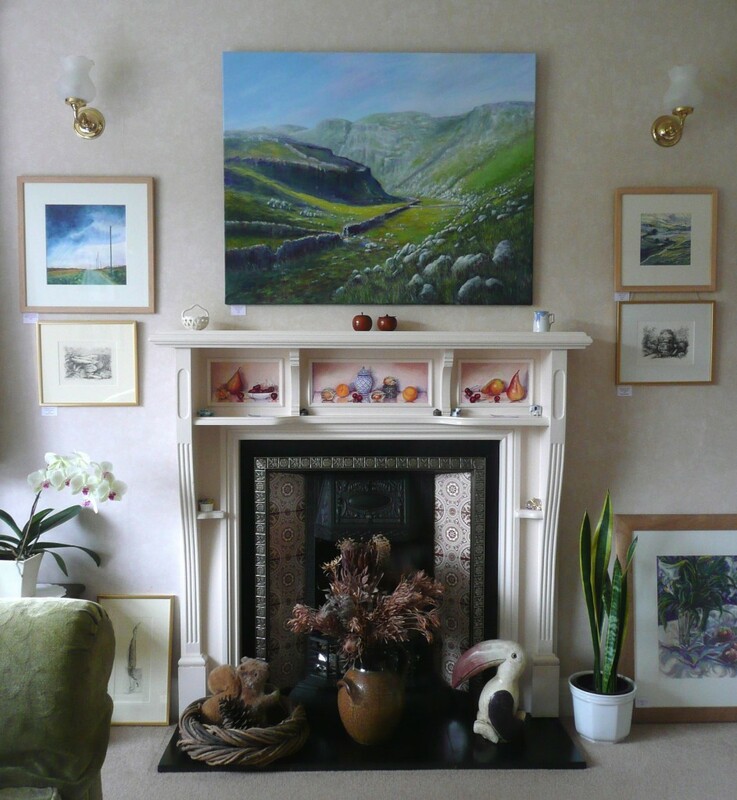 The constraints of hanging works in a gallery are mainly the wall space and configuration, and lighting, but by and large one is arranging works with regard to how they impact on each other. The walls are usually white and furniture is minimal. At home one has the colour of furniture, curtains and carpets competing for attention with the art work. Aiming for a relatively uncluttered look that is also welcoming is what I strive to achieve, even in my rather overly patterned and colourful living space. One day I will whitewash everything and bathe the house in cool white light. Images are of the hang at venue 17 of CAMAT, before my wonderful visitors arrived. 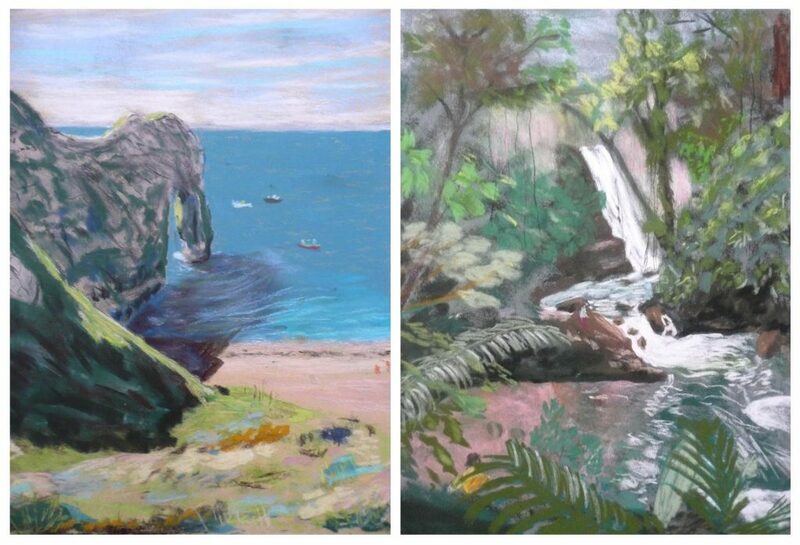 Images of the artworks can be seen on the gallery page of the web site. 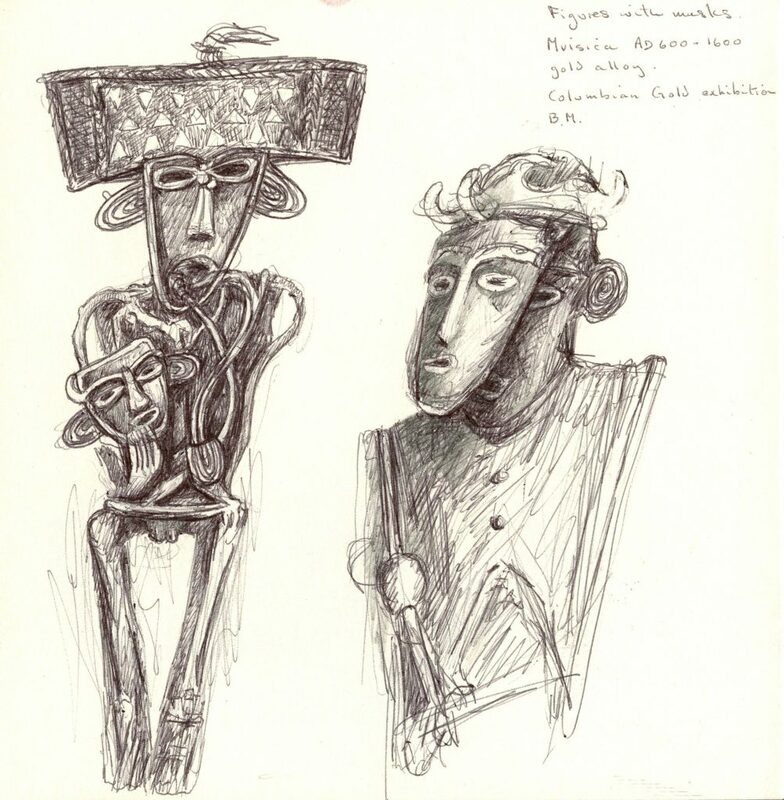 My first drawings in the African Galleries of the British Museum were of a collection of Nigerian ceremonial animal masks. 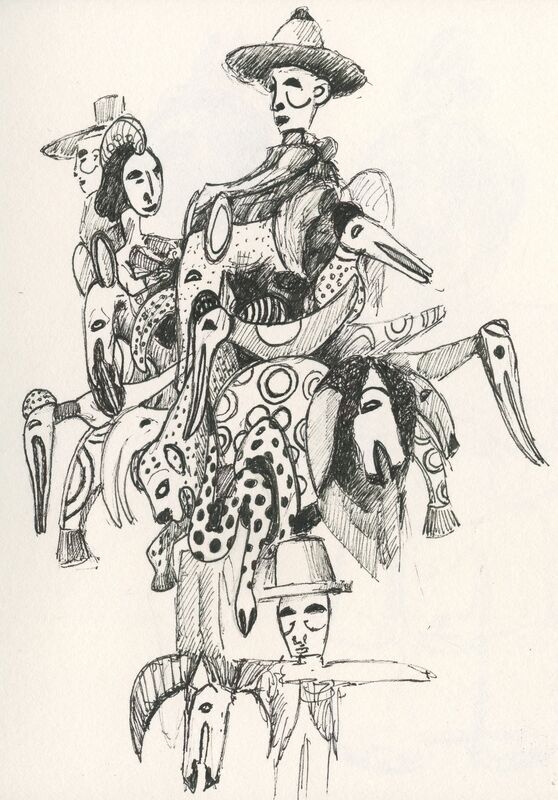 More recently I was attracted to some equally wonderful Nigerian fish masks that are worn on the head like a hat. So I drew; fairly straightforward simple drawings on two pages, wondering how I would use them. As usual they were left for months when I rediscovered them and decided to make a drawing of the fat terracotta fish on a polyester litho plate, incorporating some of the other ‘fish’ and their markings as a background of jumbled motifs. 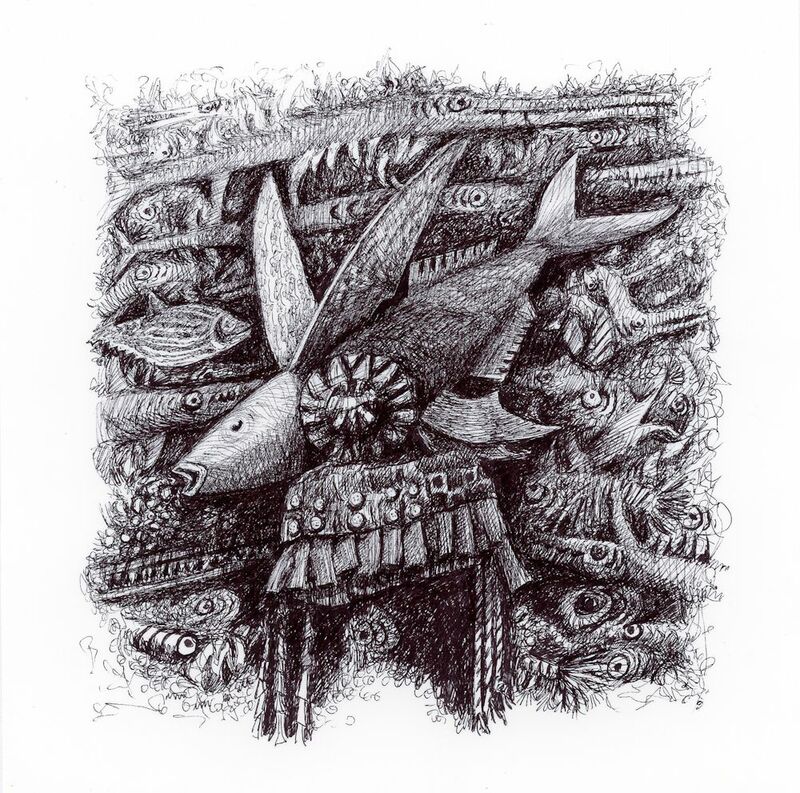 Some of the creatures were halfway between fish and crocodiles and made out of anything and everything from cardboard boxes to shirt buttons, string and feathers. What made them look even more fascinating and mysterious was their presentation. 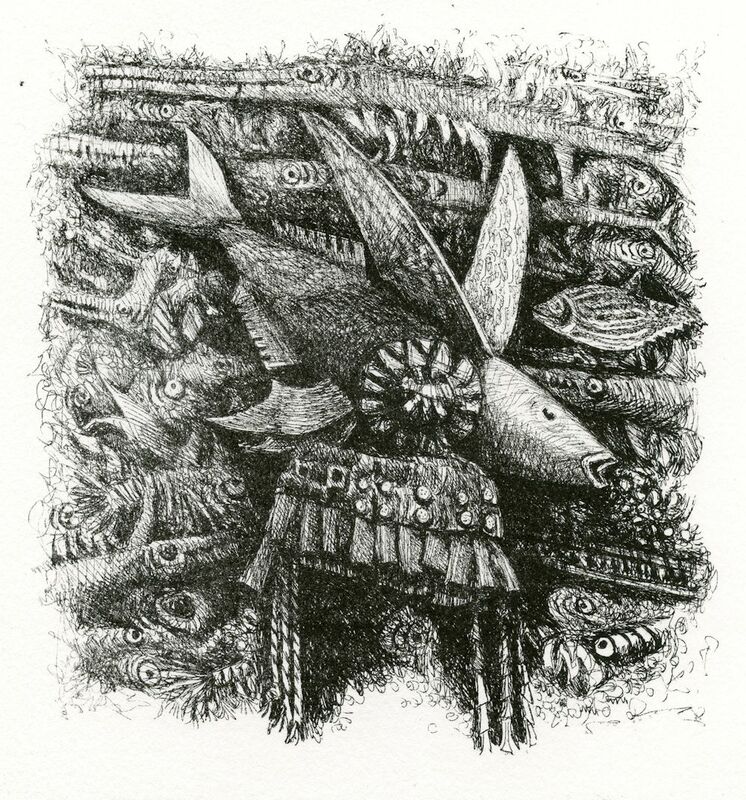 The cast shadows, especially of the long fish forms, invited a sense of imagined movement. The plate was printed last Wednesday at High Wycombe on what seemed the hottest day of the year so far! 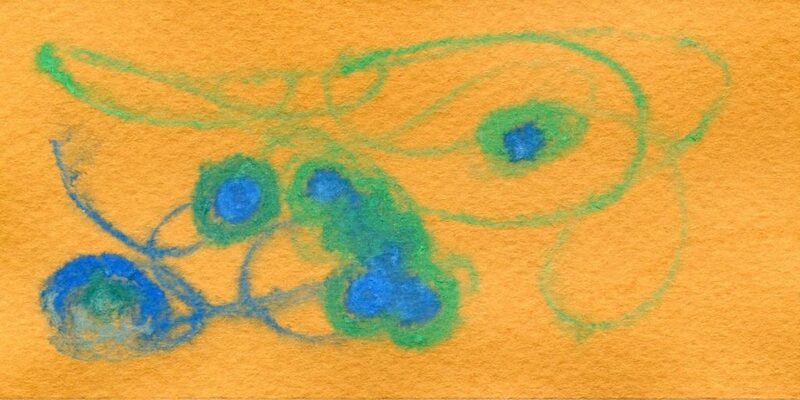 Intuitive drawings can be made with any drawing media. 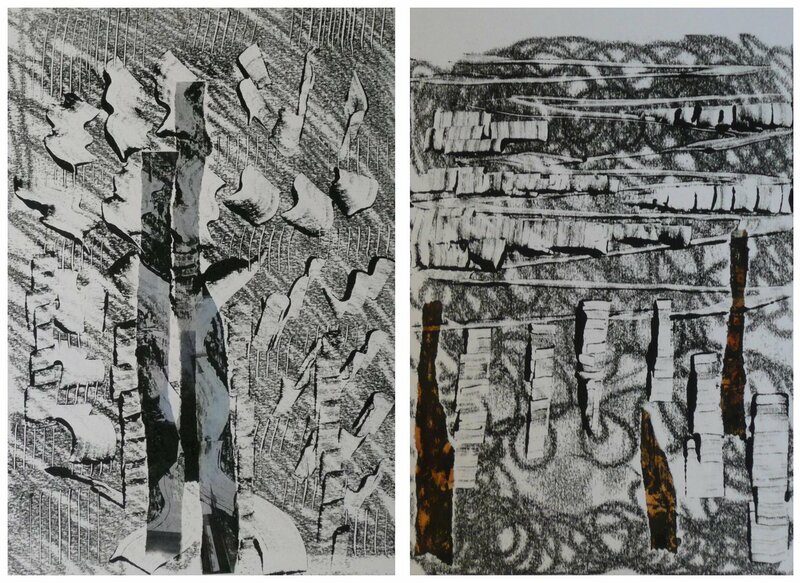 At a workshop held on 23rd April at Norden Farm Centre for the Arts Maidenhead, our focus was on transferred line drawing using a similar technique to Paul Klee. We kept to the idea of trusting our intuition to develop the drawings rather than having an end image in sight at the beginning of each visual ‘journey’. Some very imaginative works resulted. 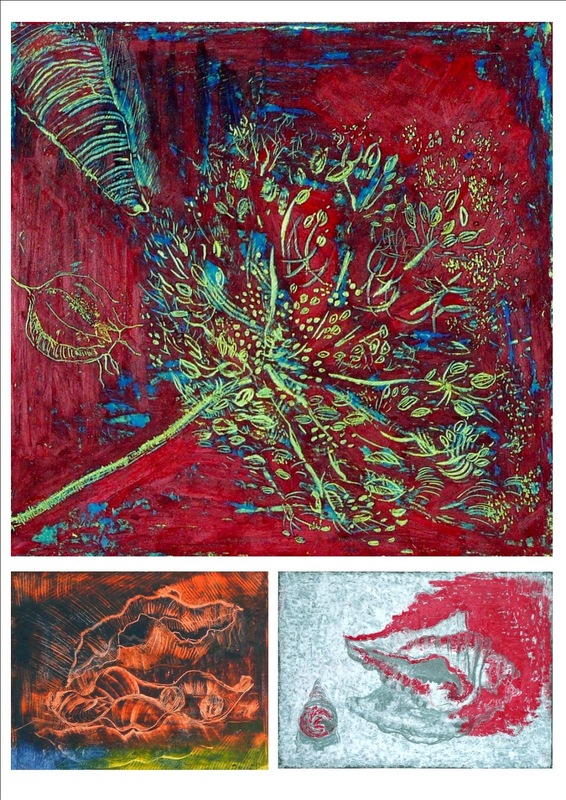 All images presented are of students and their prints made at the workshop. We began by inking up a piece of light weight paper evenly but thinly and laid this on top of the printing paper. Another piece of lightweight paper may be placed over this and drawn on so that the line is transferred to the sheet of printing paper below, using a ball point pen or stylus. Sharp pencils pressed hard can tear the paper. 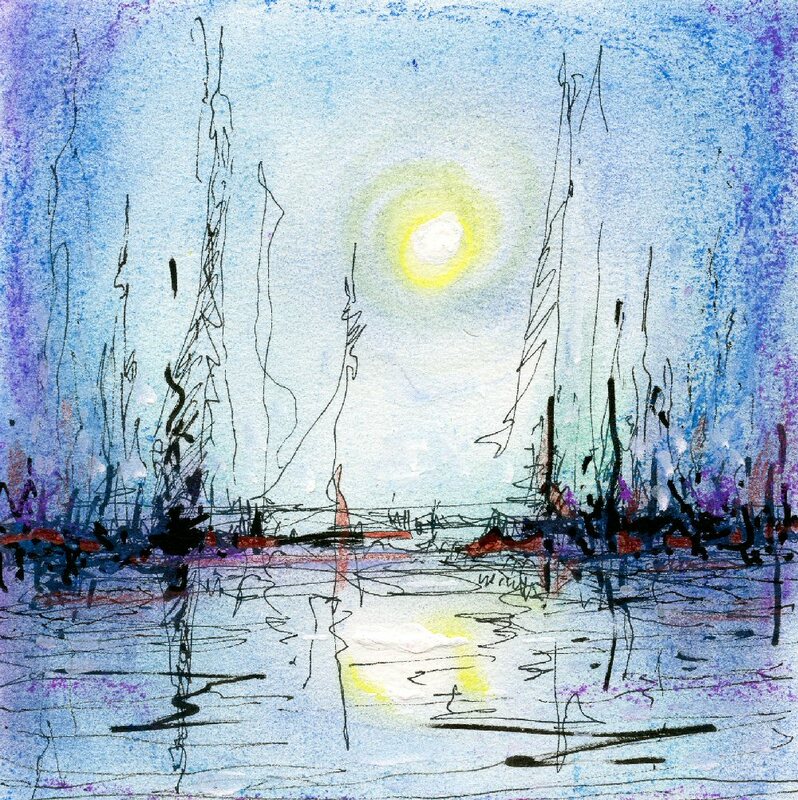 The line is similar to a dry point line, and if printed through on to heavy cartridge or watercolour paper, when the printing ink is dry, the drawing may be used as a wax resist for watercolour. 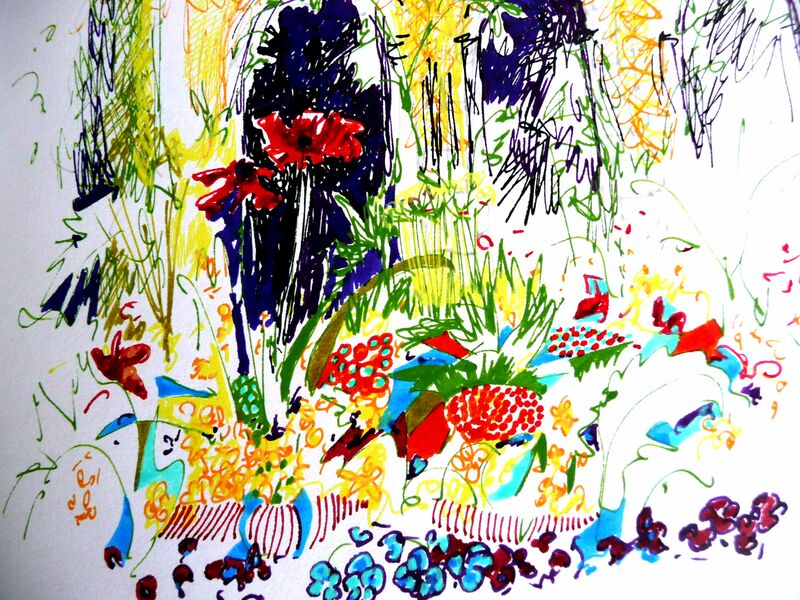 Often the print is most beautiful left as it is or perhaps with a small area of colour. 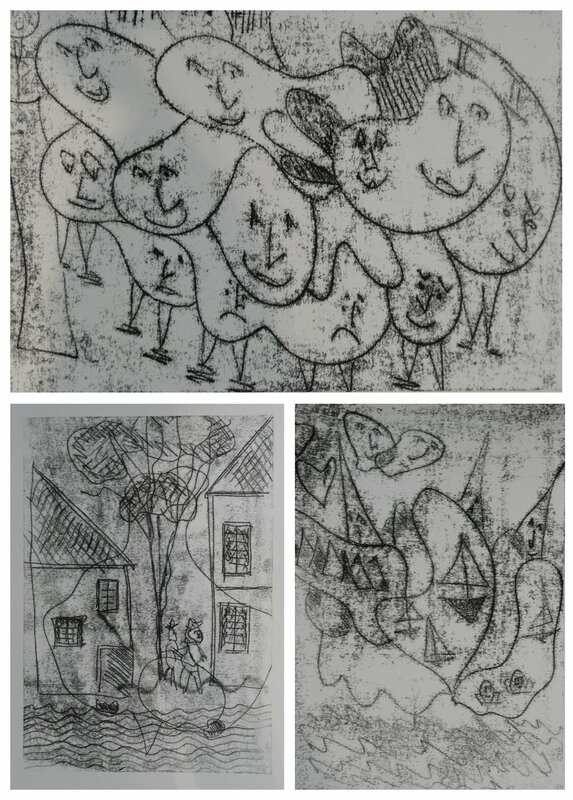 Paul Klee used a similar method for his ink and watercolour drawings. Drawing on the back of the inked up paper may be done spontaneously or a drawing may be prepared beforehand and traced. As long as the paper is thin this may be placed over the inked up paper and traced through. 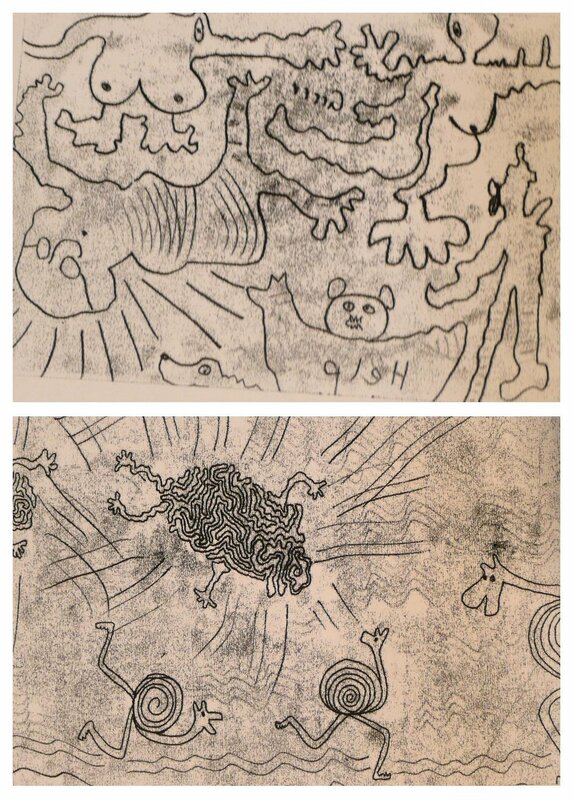 Another way, so that the original drawing is preserved and to allow experimentation with the same motif is to make a photocopy of the original drawing, ink up and trace through. Best results are when the tracing of the design is not done too laboriously so that some spontaneity of line results. We also obtained excellent results by inking up Rhenalon plates thinly but evenly. Laying lightweight cartridge or printing paper on top and drawing on the paper. 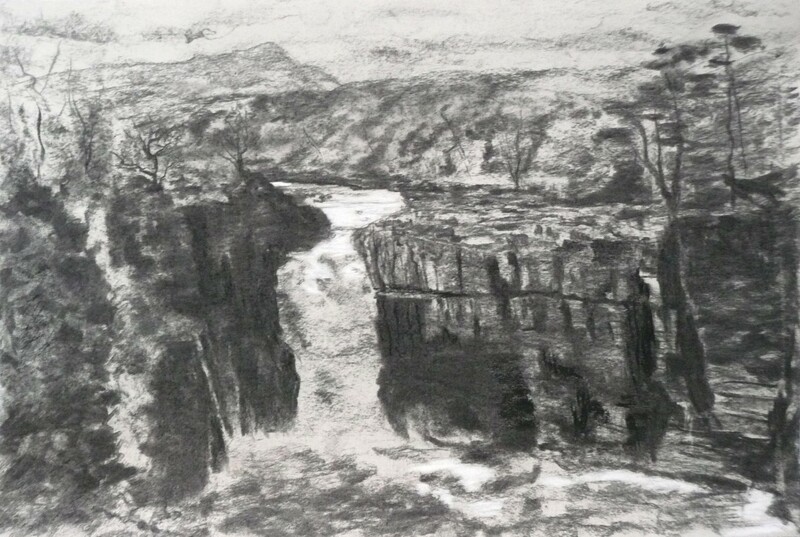 Both for the ‘paper plate’ method or by placing the paper to be printed on directly on to the plate, areas of tone can be achieved by hand pressure and using less pointed softer implements for drawing. Only plastic implements and cardboard were used for these drawings so that the plates were not scratched. 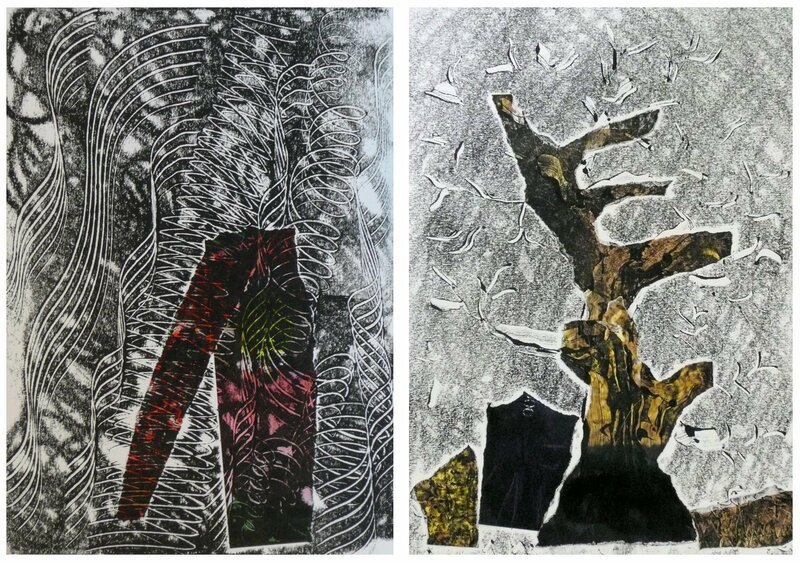 In the afternoon we used the Rhenalon plates to make monoprints and incorporated hand torn or cut coloured papers into the prints. 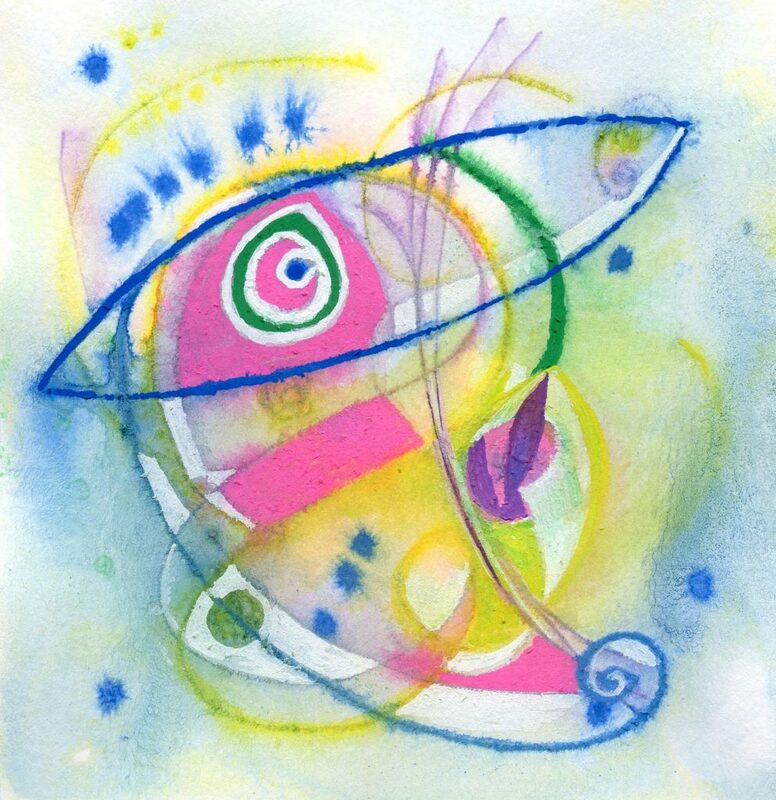 Again we had no conception of the end result of our intuitive process when we began each composition. 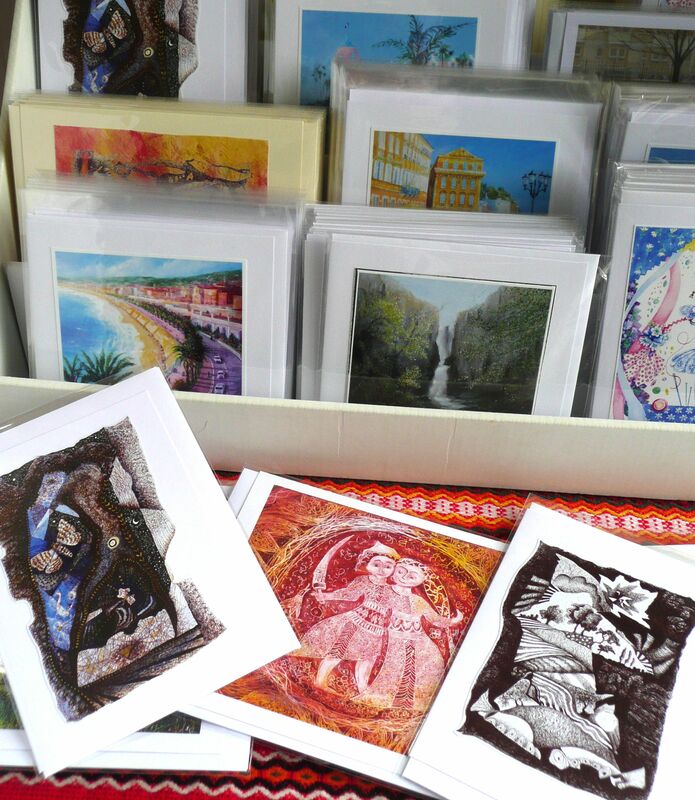 Many thanks to all who took part so enthusiastically and produced some very beautiful and some very funny prints! This post is adapted from the artist’s statement accompanying her recent solo exhibition. At first sight the exhibition ‘Seen and Imagined’ appears an eclectic mix of abstract, fantasy, and representational work. I think of it as more like a marriage of observation and ideas. In this post I hope to demonstrate how I drew on the observation and imagination of others, and my own observation and imagination to produce the works shown. 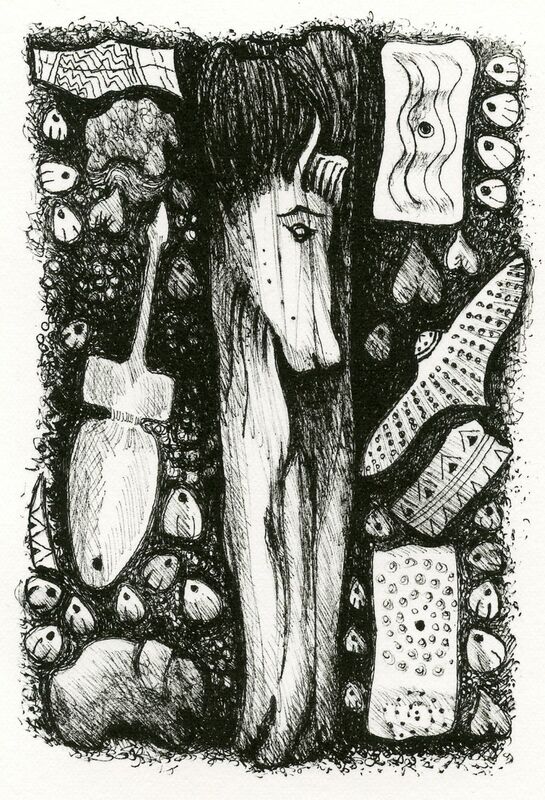 In the tiny lithographs from drawings made of objects shown at the Ice Age Art exhibition at the British Museum, I drew on the imagination of artists of up to 40,000 years ago. 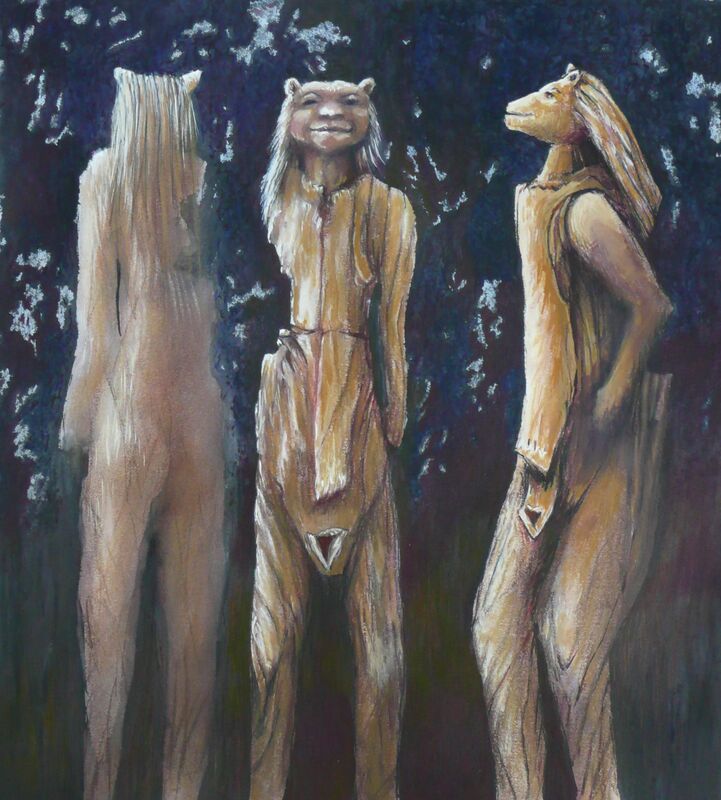 The skills of these artists led to the production of both highly stylised and representational carvings of natural forms, animal and human, and also to the development of ideas of fantasy creatures such as the ‘Lion Man’. 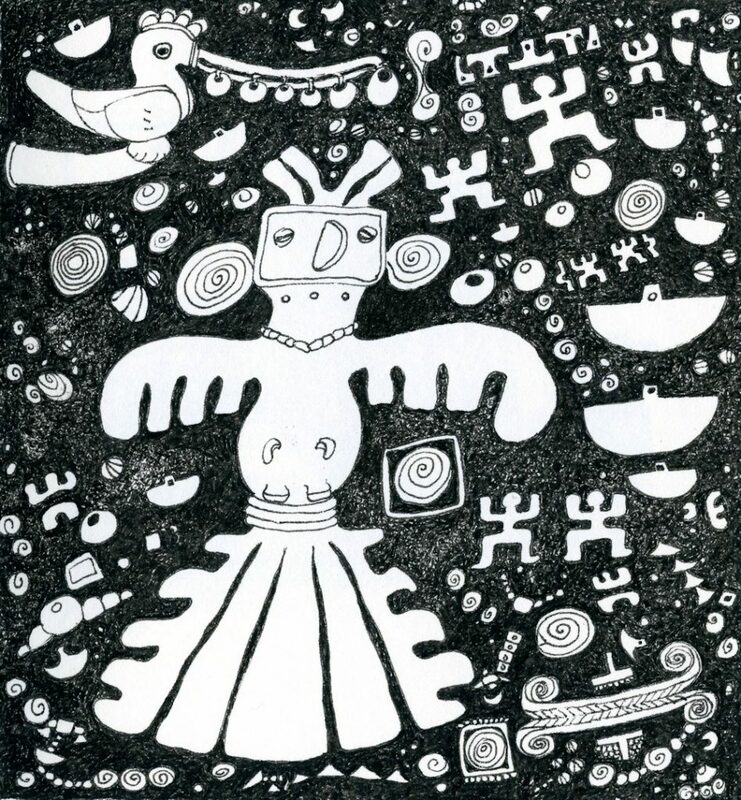 In Nordic Legend: Fragments I played with imagery from Viking stones and fragments of the Sutton Hoo treasure to compose a work where all the elements from a Nordic Myth can be identified. The story tells of how Sigurd the Volsung and his blacksmith (the evil Regin in disguise) set out to slay a dragon (really Regin’s brother Fafnir) who was guarding a great treasure. Once dead the blacksmith asked Sigurd to roast the dragon’s heart. Sigurd burnt his thumb and sucked it, so when magic dragon’s blood touched his tongue he understood the chattering birds warning that his blacksmith planned to kill and rob him. AT ONCE Sigurd chopped off his blacksmith’s head and rode away with the gold! The shapes in this work derive from the extended lines from a life study which suggested the rocking of a ship, so no wonder I was drawn to the myth of a sea faring nation. 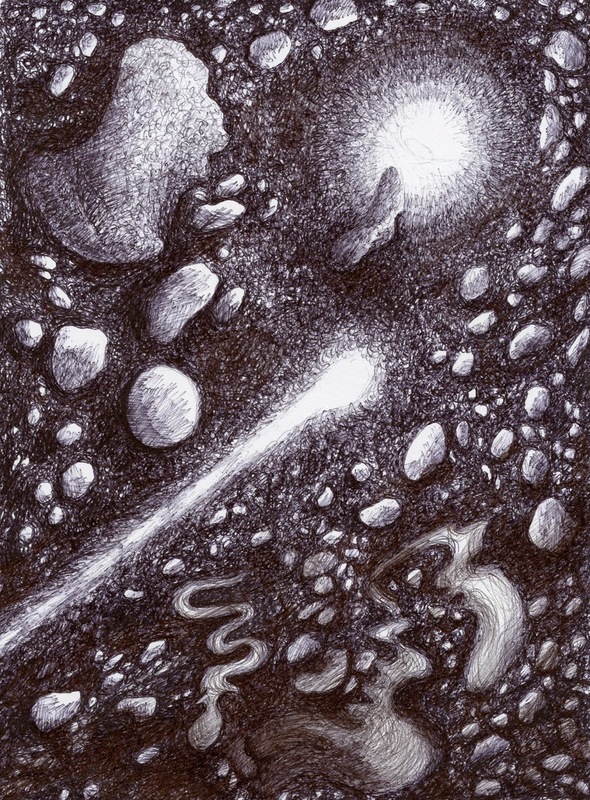 This process is intuitive in a similar way to that of ‘word association’ which I will call ‘image/thought association’. 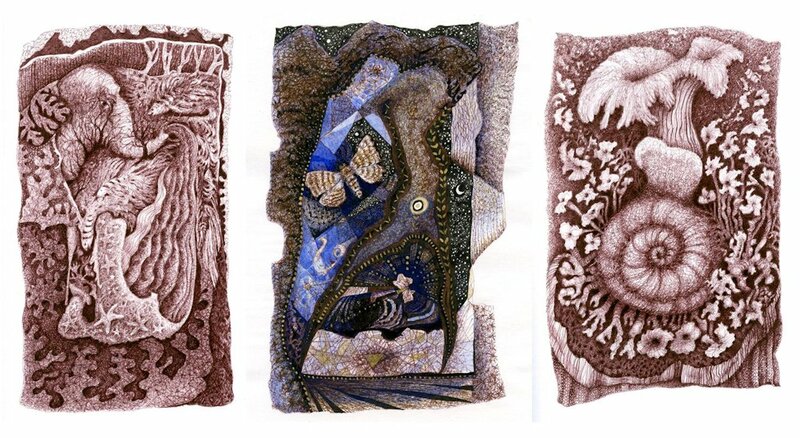 The ink drawings which started as no more than a few scribbled lines and which developed into the series I think of as Unnatural Histories, represent a similar intuitive process.. The outcome of this approach possibly reflects my former career as a biologist and interest in the transferred line drawings of Paul Klee. I have a strong belief that our minds carry visual ideas that only surface when we find a way of tapping into the imagination. 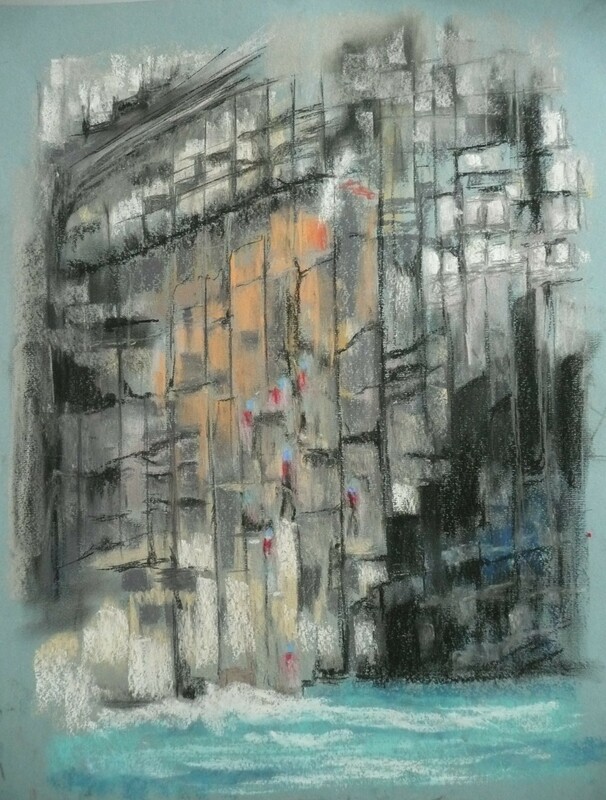 Land and cityscape painting and drawing form a large part of my practice, and although for these works observation is of huge importance, I like to think the imagination brings to life the emotion or idea the artist hopes to convey in each painting. 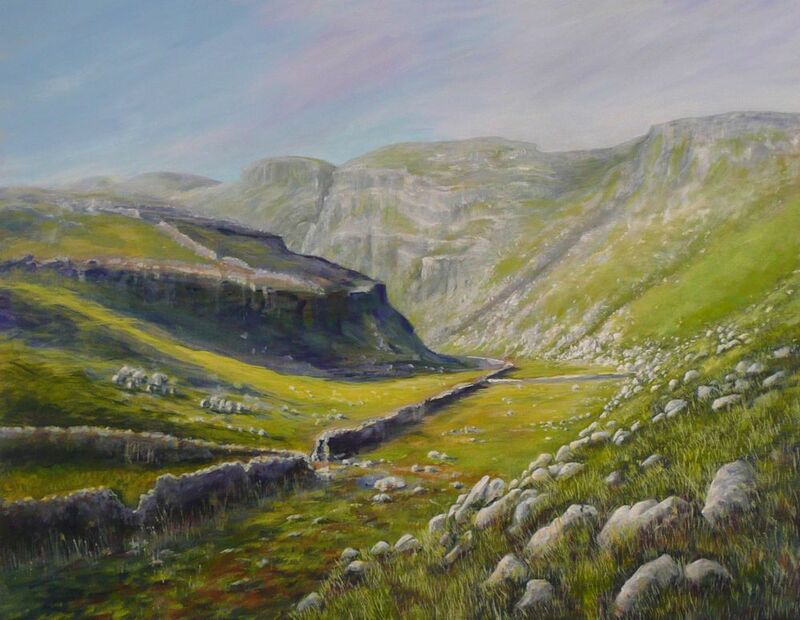 Crossing the Dry Valley high up on the limestone, on the way to Malham Cove from Gordale was a dramatic experience. Its grandeur was only surpassed by my curiosity to know what lay beyond the bend. 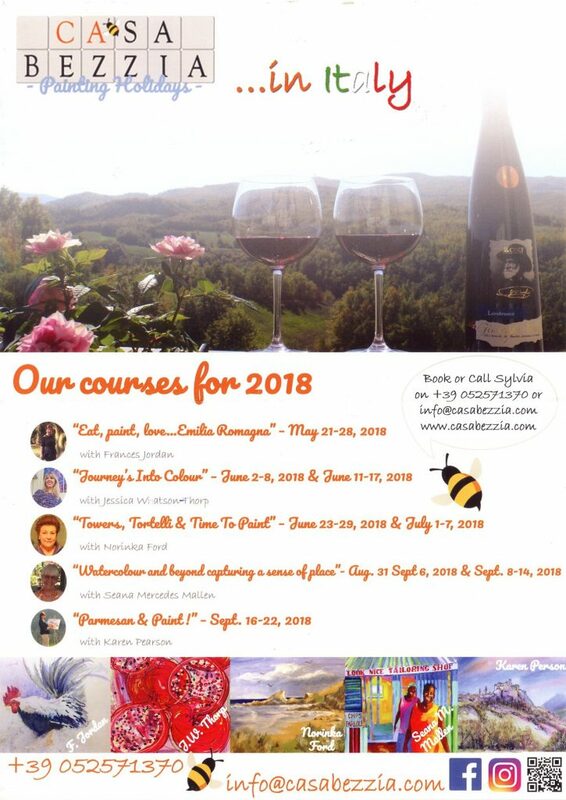 I hope to invite your curiosity too. 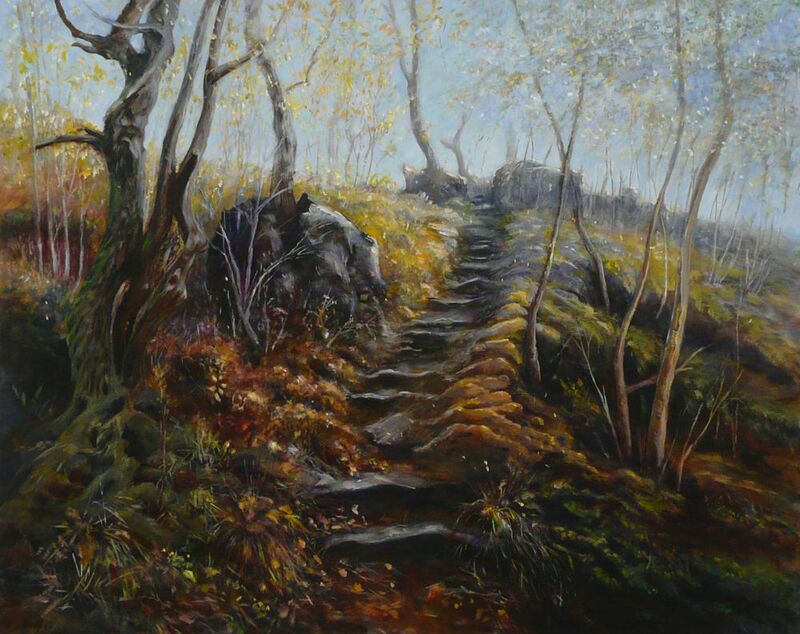 The painting Ancient Steps to Winskill Farm depicts steps cut into the limestone and weathered over many years. Even the locals seem to know nothing of their history. I wanted to feel again the mystery of the ancient steps, dark recesses in the rocks and tangled tree roots, but most of all to make that upward journey once more. 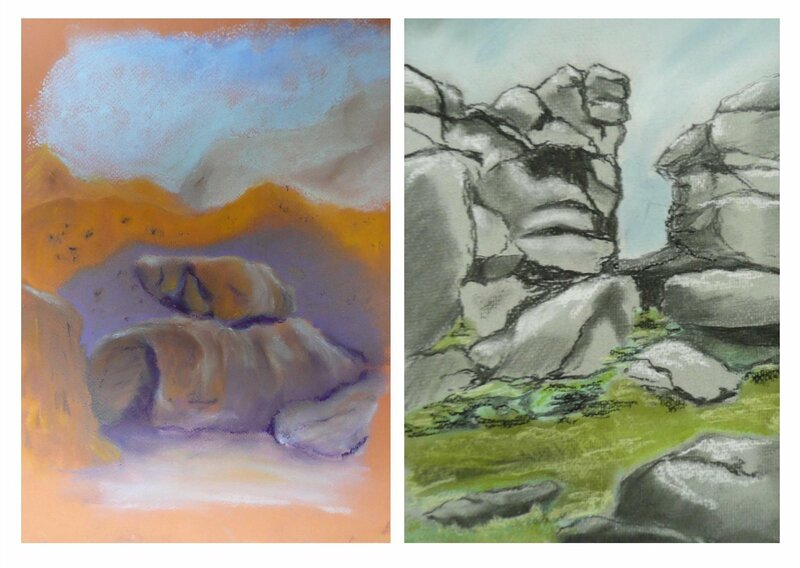 Our landscape is continually subject to changes in colour and mood so in Fog and Mist I chose, very deliberately, three pigments for each painting. 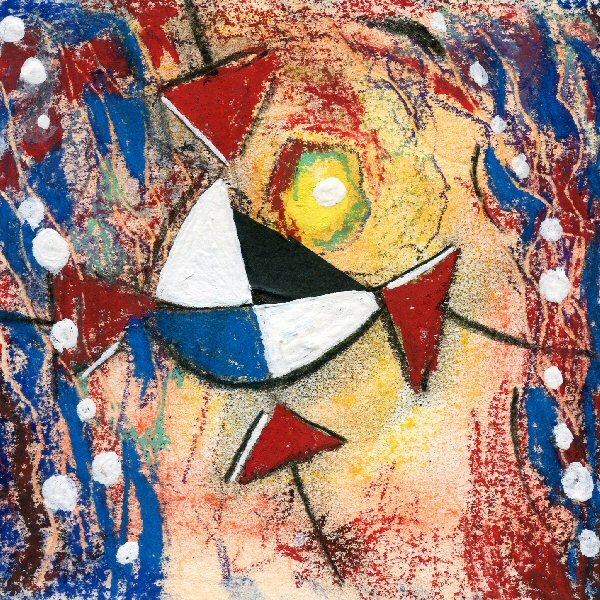 I then made mixes, laying down small irregular squares of colour intuitively, each decision suggesting the next. The pigment choice was logical but the process of laying them down and the patterns that evolved was more intuitive. 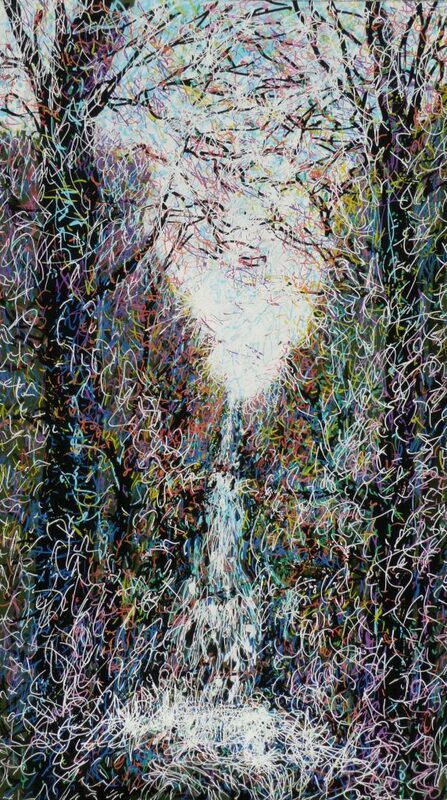 With Drift and Transience the approach was more experimental; simply laying or rolling in washes over wax applied rather randomly, then continuing in a linear manner with brush lines of colour till each work was resolved. The titles for these could only be given on completion. Lastly I have made many small sketches of people on the Jubilee Line between Baker Street and North Greenwich. One of these was a beautiful young woman asleep, her black curly hair severely swept back from her face. I wondered what she would like to dream about. 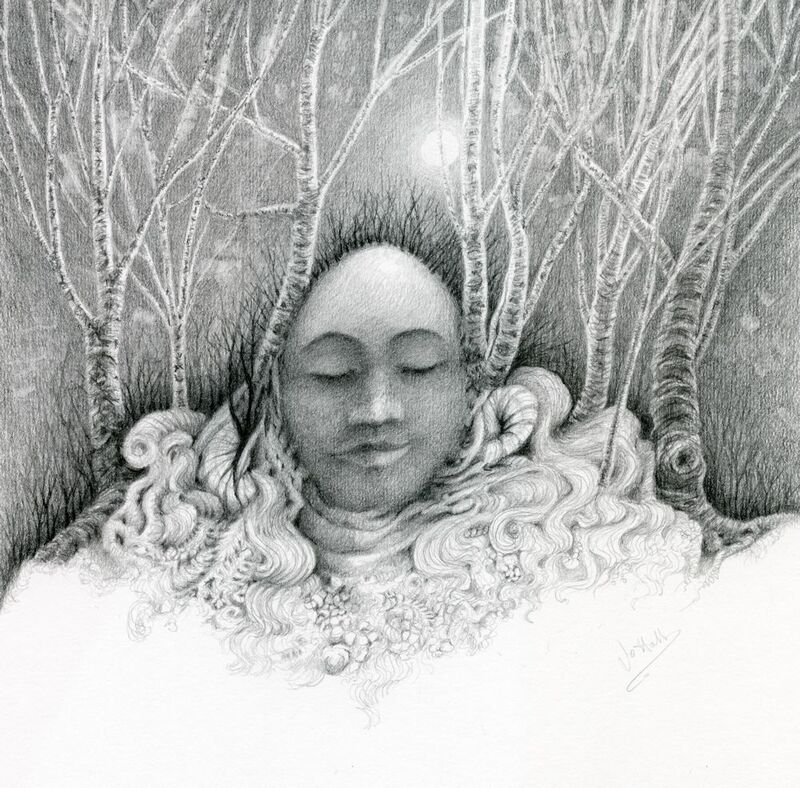 Her pleated swirly silk scarf suggested the life of the forest floor so here she is, in a tunnel below London, dreaming of the forest. These are just a few thoughts on some of the 38 works on show. ‘Seen’ is easy to define as that which is observed. ‘Imagination’ is often thought of as the ability to evolve ideas, or to create mind pictures, not seen by the eye but nonetheless ‘seen’ by the mind. 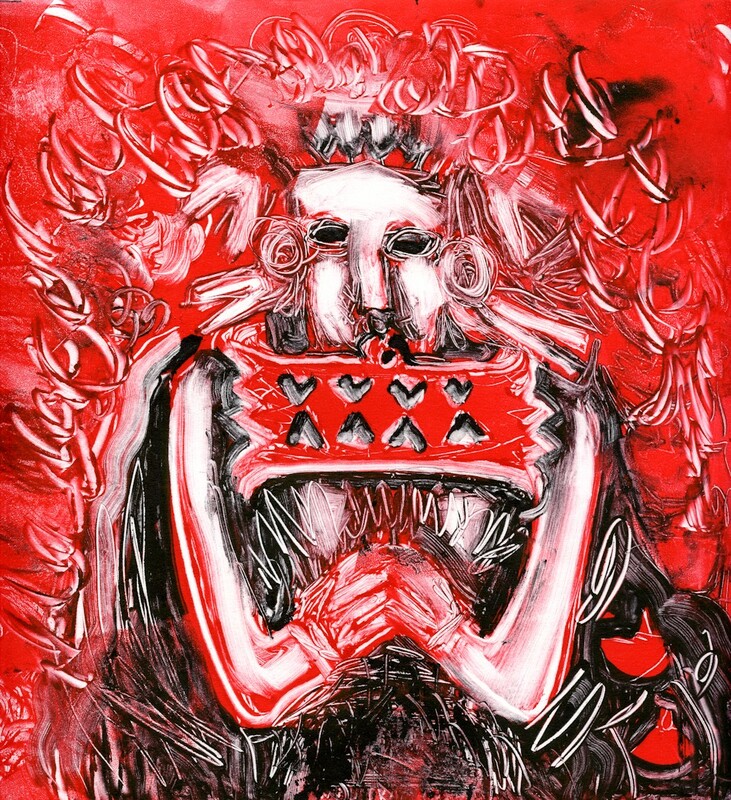 Rooted in conscious observation or begun more intuitively all works exhibited are thus both Seen and Imagined. 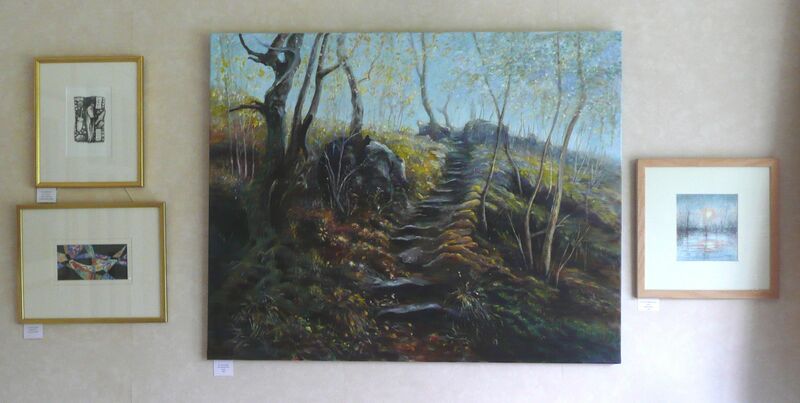 I would like to thank Norden Farm Centre for the Arts, Maidenhead for sponsoring the exhibition which continues till March 20th. My work is usually preconceived, carefully worked out with regard to composition, and usually has a very definite relation to objects observed, sometimes minutely. But I also doodle. Why? Search me! All those strange lines, frantically scribbled and angular when irritated or smooth and round or just skipping gleefully across a discarded envelope are surely as expressive of character and emotion as any representational drawing I may make. They are possibly not art, but they are far from mindless. They make their journey across the paper without knowing the route they will take or their final destination. Sadly with a doodle this is too often truncated by the end of the call and the paper scrunched up and trashed. 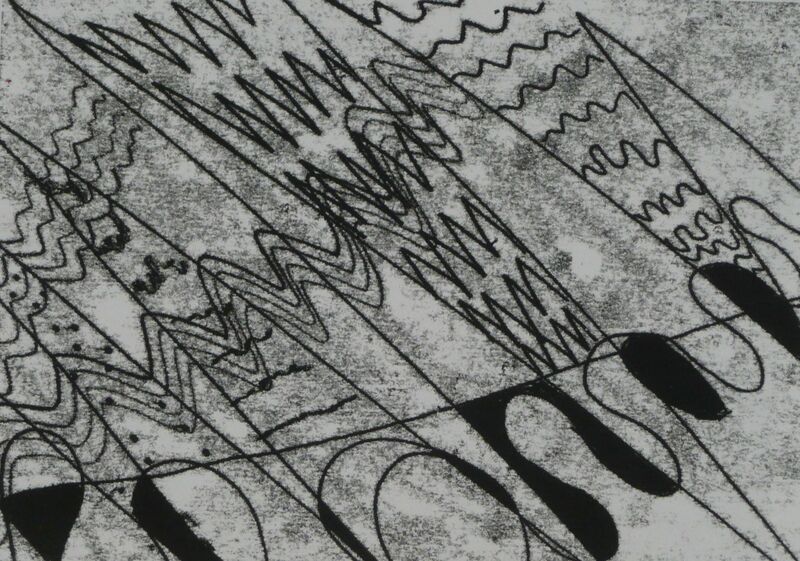 Drawing has been described as the making of meaningful marks. It is the closest thing to a universal language from which meaning can be extracted in a split second of recognition. 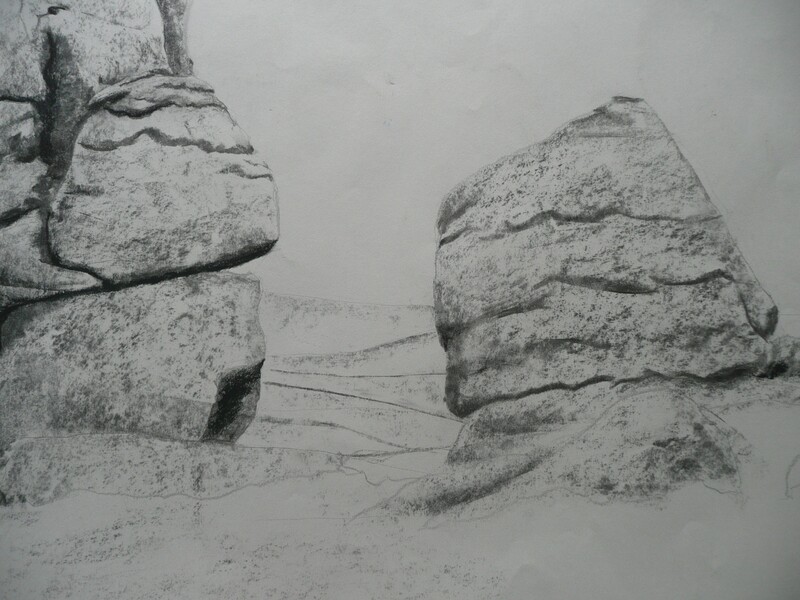 However I can start to draw lines without any plan to make a recognizable form or I can deliberately set out to draw an object. 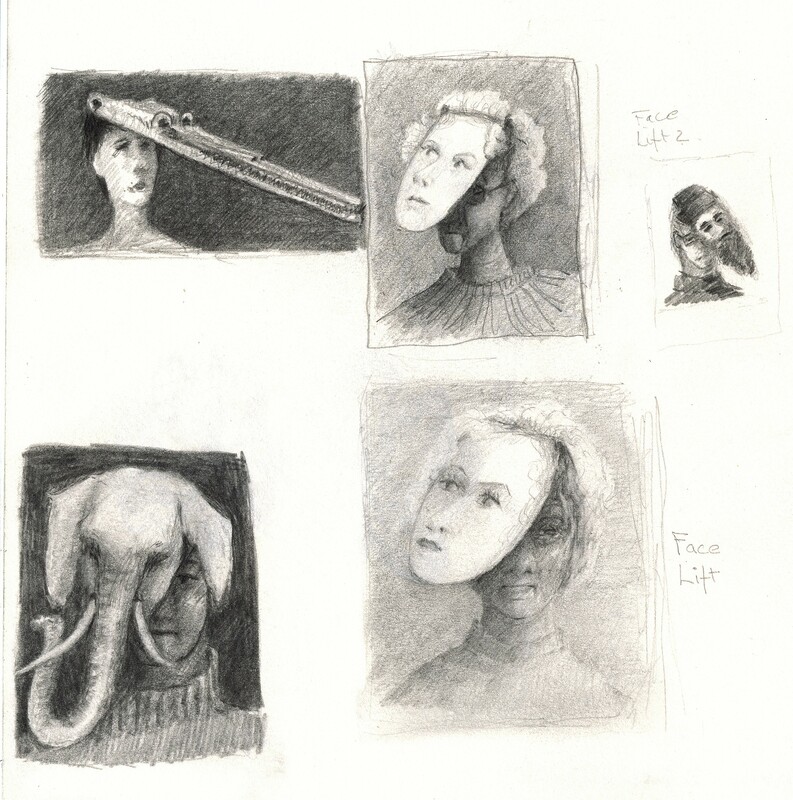 It is the former which often feeds the imagination, and trusting in continuing the drawing process, recognizable forms or totally abstract compositions may result. Questions will be asked along the way and decisions made as to the next line or direction. 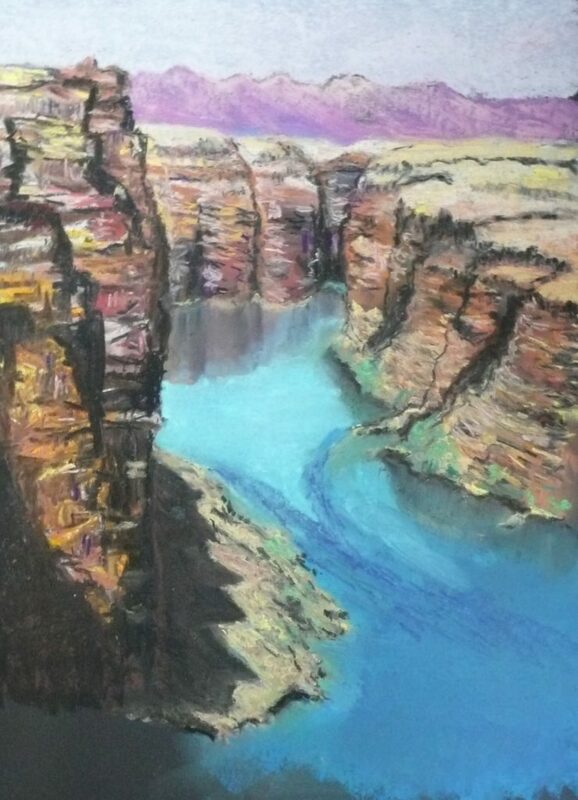 There will be an arrival point at which the artist feels the work is complete but there will be no preconceived end point and no prior plan for the journey. All kinds of fantasy images may emerge. Paul Klee was arguably the greatest exponent of this kind of drawing and the following is a quote from Robert Kudielka writing on Paul Klee in ‘Paul Klee: the Nature of Creation’, the book accompanying the exhibition of the same name held at the Hayward Gallery 2002. 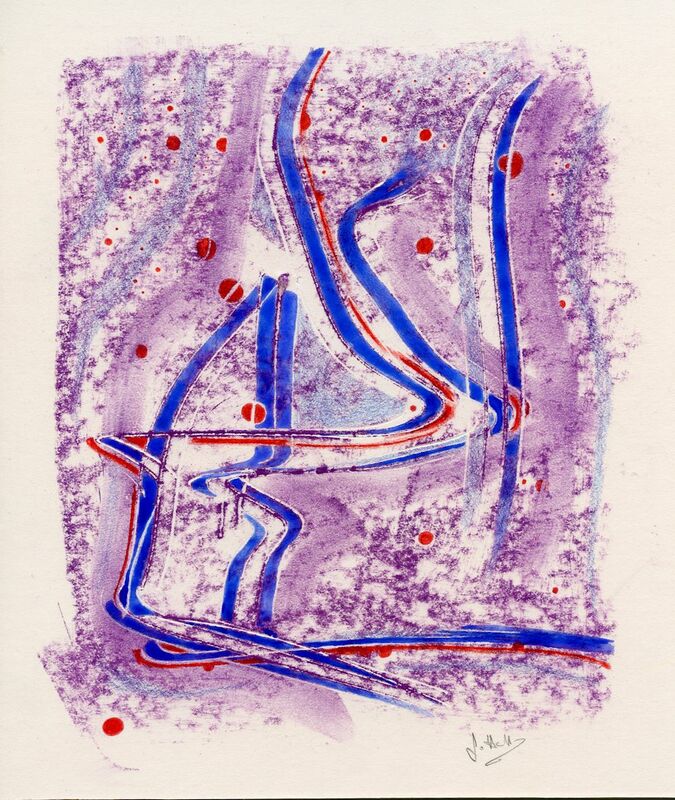 ‘He (Klee) takes both his imagination and ours on a journey that opens up unforeseen landscapes, as he himself suggested in his ‘Creative Credo’ (1920). But the trajectory of the line could also lead to constellations that were directly reflective of the artist’s own intuitive hunches. In ‘They’re Biting’, (1920), small fish approach the lines of two anglers while larger ones lie waiting below, unimpressed. Or the hand of the artist, in sweeping gestures from left to right, could release the movements of ‘Veil Dance, 1920. But all these configurations would only be recognized en route and named at the end, instead of being intended and sought from the outset. 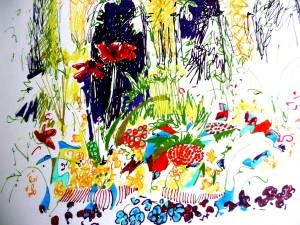 Suppose I decide to make expressive marks on a piece of ‘good’ paper, expensive paper, hand made art paper. Will I let go of all preciousness and make lines according to my mood, or become self conscious, battered by the logical half of my brain full of anxiety about ruining a beautiful paper? Small children can do this but they have not suffered a lifetime of judgment, criticism, rules, and failure (neither have I!). It is not surprising that some of the greatest artists have wished to draw as a child draws in this regard. 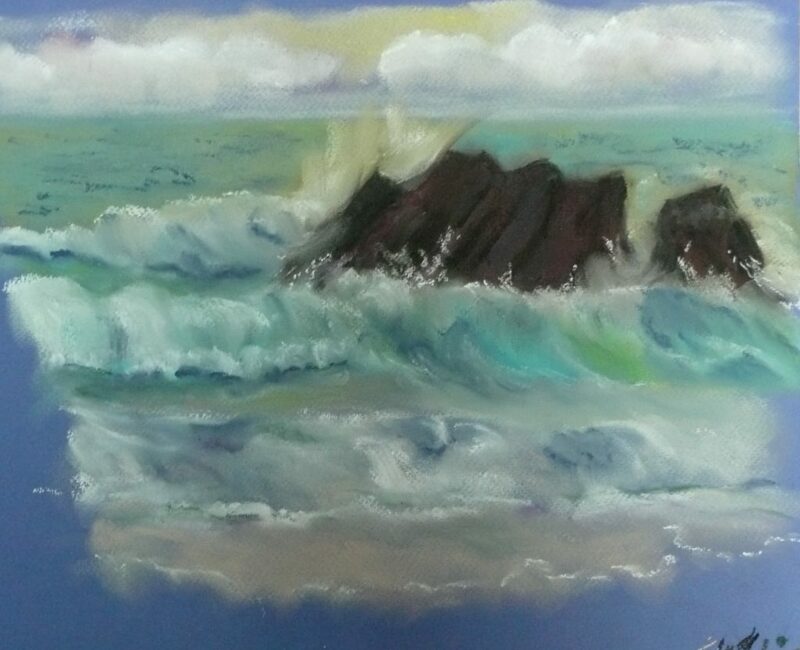 Realizing the need to be free of such fetters I invited a workshop group to close their eyes for a few minutes, feel the edges of the board or paper, and make a few blind marks, thinking beforehand only that these might be frivolous, calm or angry. 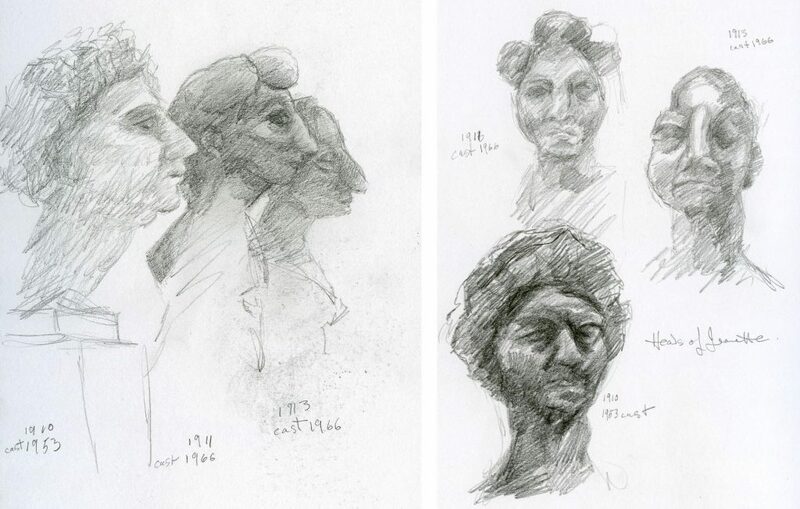 They were then invited to develop the drawings intuitively, adding lines or patches of colour in ways suggested by what was already on the paper, adding to the drawing or painting until in their eyes an arrival point had been reached. 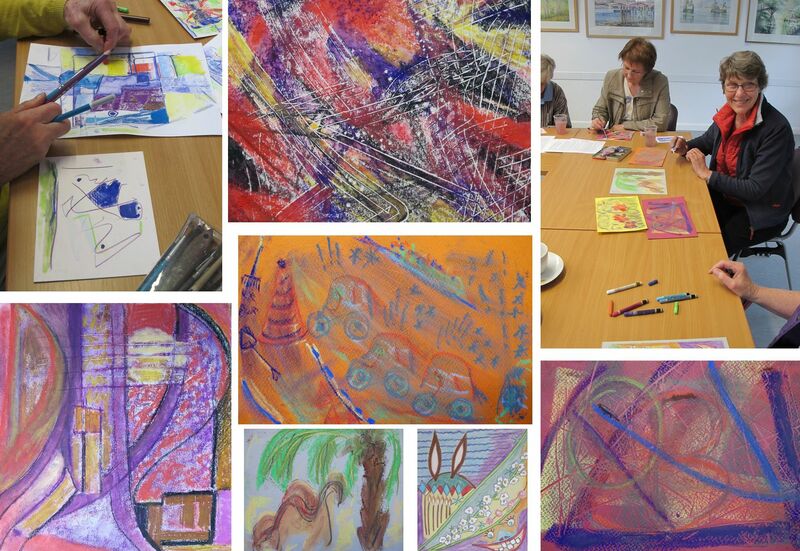 Pictures below are from the workshop held during the ‘Excursions’ exhibition at Bourne End Library, in May 2015. 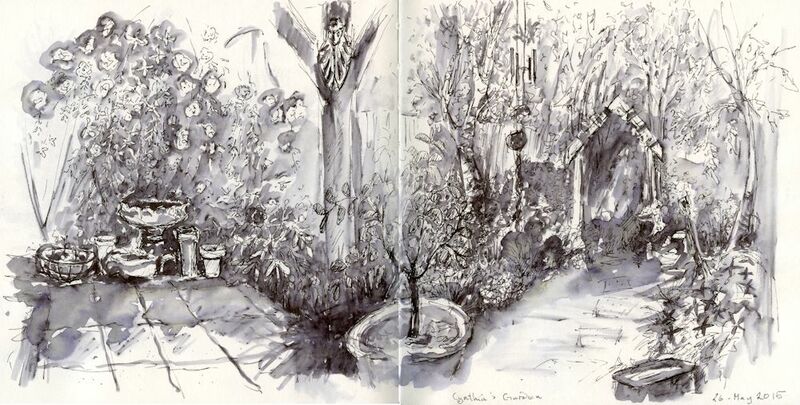 My favourite form of gardening is taking tea in someone else’s garden with a sketch pad to hand. The sketch is necessarily rapid as social graces prevail once tea is served but it’s amazing what can be accomplished while the kettle boils and the subsequent infusion process completes itself. One can always use a water brush later to establish more tonal variation. If you are excited by colour, textiles, fashion and costume design, the Sonia Delaunay exhibition at Tate Modern is a must see. The critics may be right that her painting reached its zenith with the ‘Electric Prisms’ series, but what determination when funds failed, for her to launch a fashion house and bring her art to a huge audience with designs that influence and inform the designers of today. It is also a stunningly presented show! 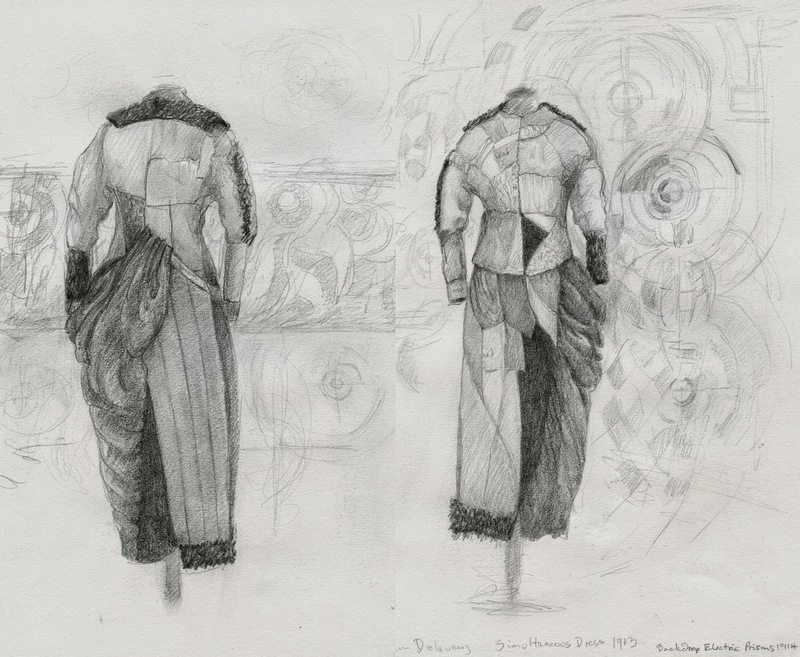 A quick glance at the catalogue showed it did not treat its readers to the back view of the ‘Simultaneous Dress’ she designed to wear to the tango ball room. Here and in the Portuguese markets she drew much inspiration from movement and colour that became part of her journey to pure abstraction. Sadly I had no coloured crayons with me but working in monochrome I realised she not only cleverly juxtaposed colours but also textures, and flat fabric against ruched or gathered pieces. I will be visiting again soon! Sgraffito is a word derived from the Italian word ‘graffiare’ to scratch. The boys and idlers of Pompeii may have invented graffiti as an undesirable way to scratch into layers of pale plaster to reveal their messages in the underlying darker plaster layer, but similar techniques have been used with enormous skill down the ages; in architecture, especially surface plaster decoration, ceramics and fine art paintings from ancient times to the present. 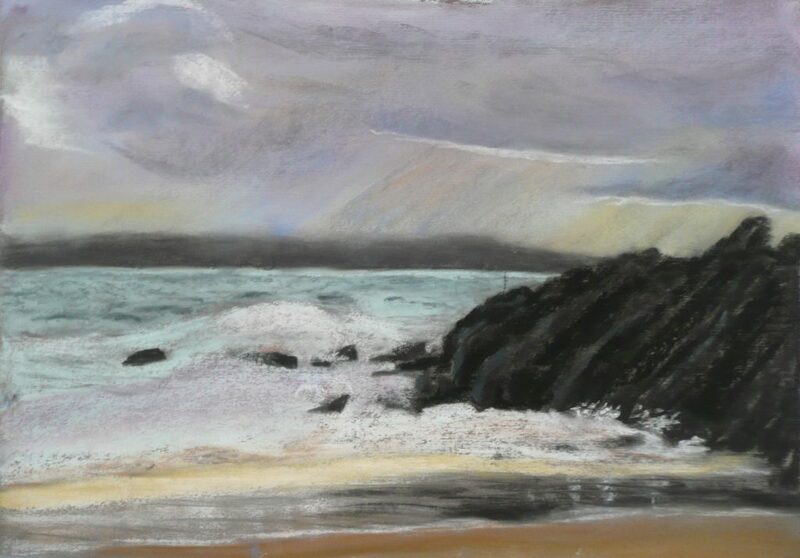 Oil pastel is a useful medium to experiment with this technique and also a great way to draw with unconventional tools, using anything from a plastic comb or nail file, to a lolly stick or flexible palette knife. Most of these and more were used at a one day workshop I was delighted to lead at Norden Farm Centre for the Arts, Maidenhead. We began by rubbing in a base layer of pastel, covering the support well and then applying a second darker layer. We then used a battery of implements to scratch into the pastel revealing the lower layer. A more subtle result can be obtained by applying one layer of pastel and scratching or scraping back to the paper or board support. 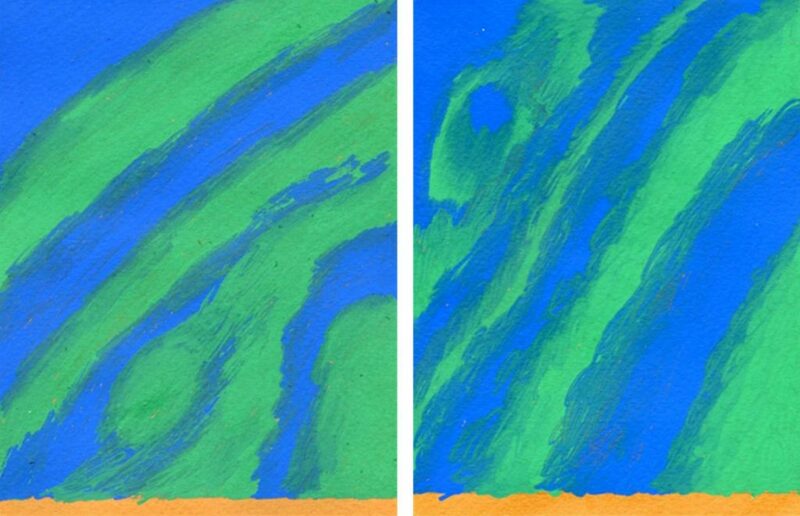 More precise marks can be made by rubbing one layer of pastel over dried acrylic paint. 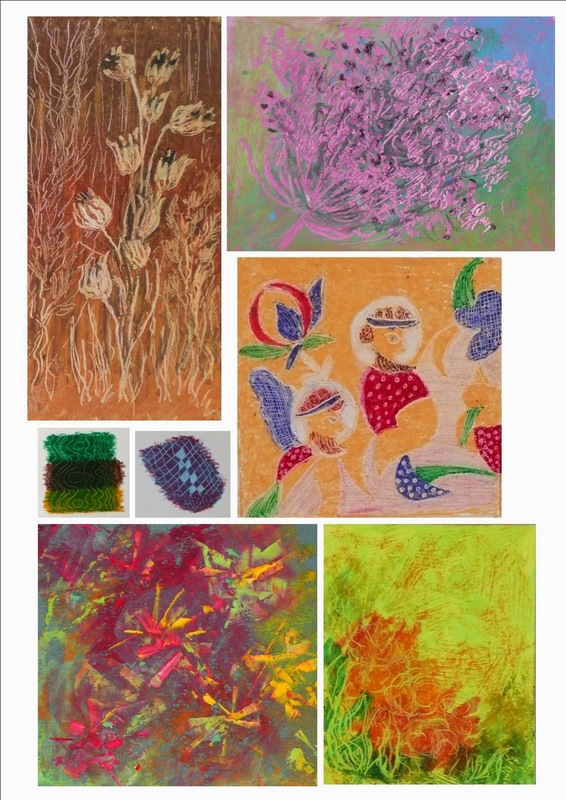 These are some of the participants’ works and experiments. 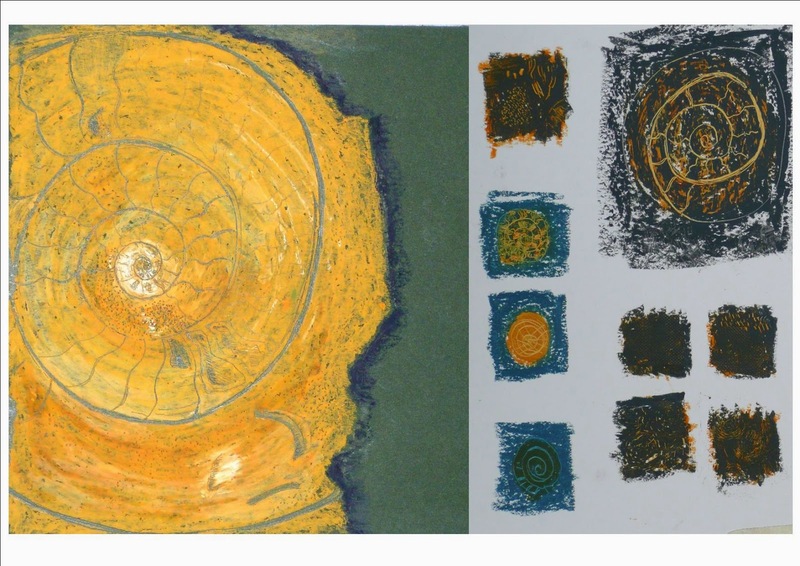 Sgraffito is a wonderful way to explore drawing and colour simultaneously and the results were vibrant and full of interesting marks. 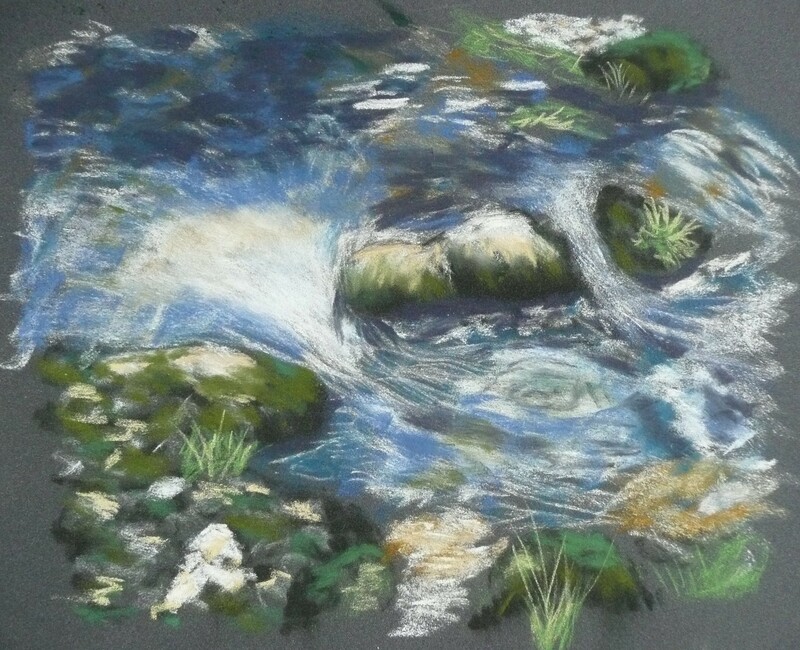 Sgraffito is an excellent way to make the finest of lines with oil pastel and is particularly useful to add surface decoration or fine detail, or to add texture to a rather flat area. 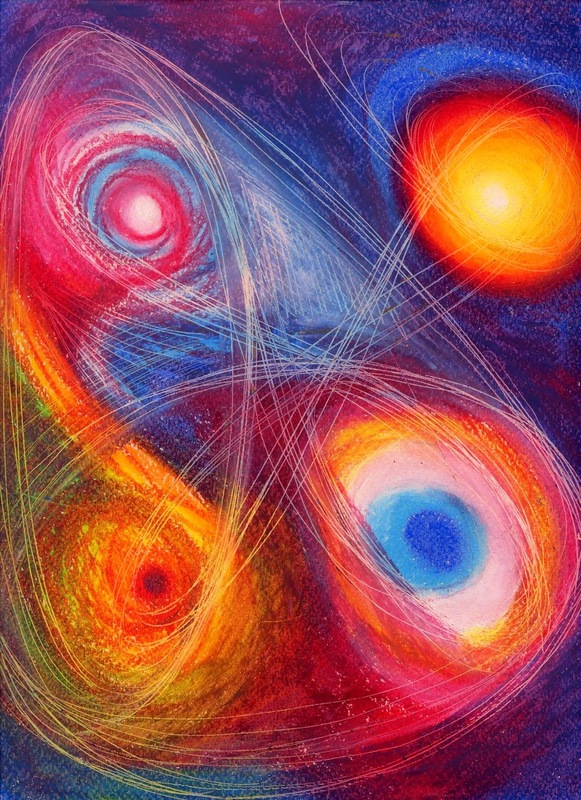 Oil pastel is a great medium with an interesting history. In 1921 the Sakura Cray-Pas Company was set up in Japan to develop an improved quality wax crayon. This was a direct response to an attempt to give young Japanese children a medium allowing them to work freely with colour, replacing long hours spent copying ideograms in black India ink. 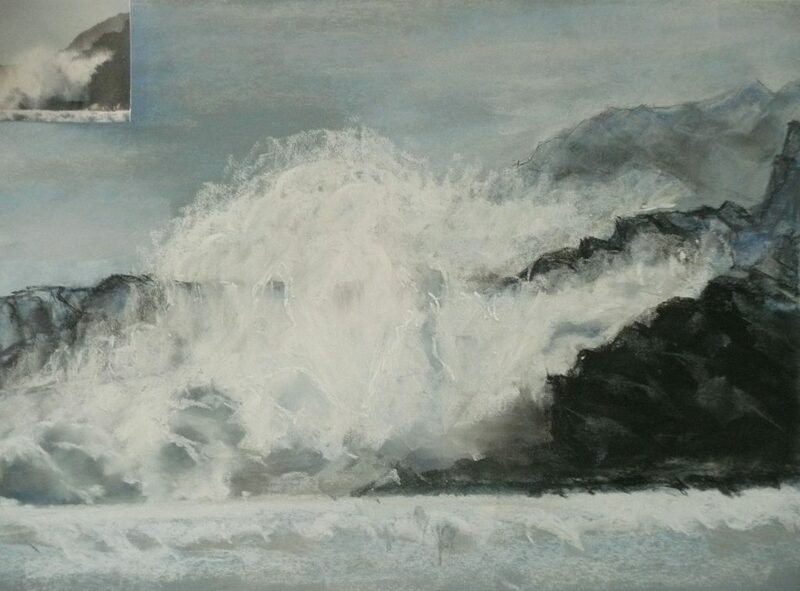 Sadly the product had a low pigment content, and blending and impasto effects proved impossible. By 1924 Sakura developed a high viscosity crayon: the oil pastel, comprised of a mix of paraffin, stearic acid and coconut oil mashed and used as a binder for the pigments. Till a stabilizer was developed in 1927, two types were produced; winter pastels where additional oil was added to prevent hardening and summer pastels with very little oil to prevent melting. 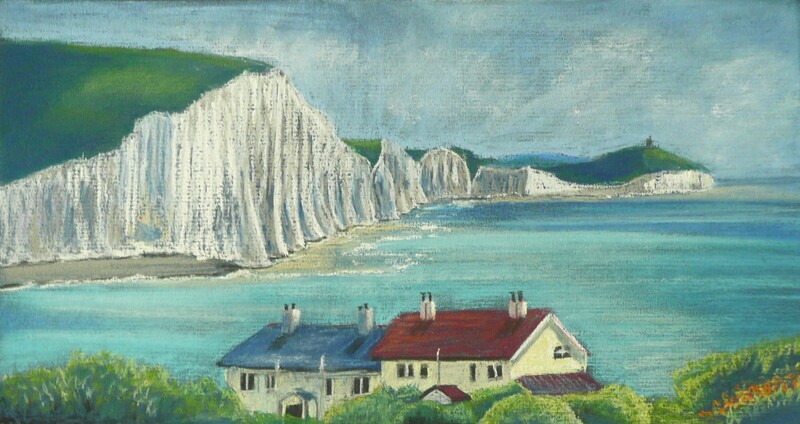 Unfortunately these pastels were too expensive for state schools and Japanese schools at that time were sceptical of self-expression in general, so cheaper coloured pencils were imported from Germany. Commercially, oil pastels were a success, but not at all comparable to professional quality oil pastels available now. These early products were intended to introduce western art education to Japanese children and not as a fine art medium. 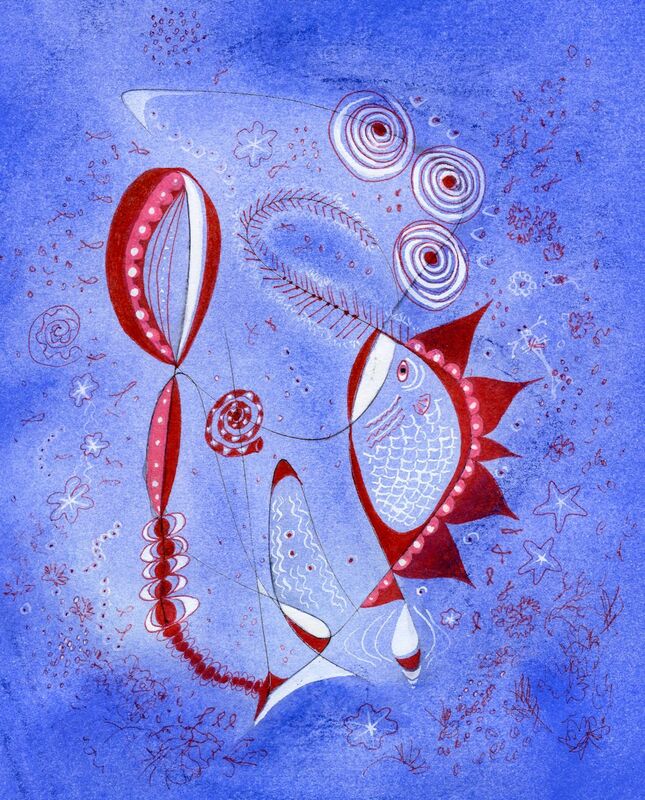 However, Sakura did manage to introduce oil pastels to a few artists including Picasso, but during the second world war these became unavailable, so Picasso convinced Henri Sennelier, a French manufacturer of quality art materials, to develop a fine arts version. These became available in 1949; superior in wax viscosity, texture and pigment quality and capable of producing more consistent and attractive works. 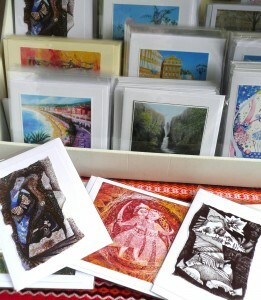 They are many professional artists’ preferred choice today. The information above was gleaned from Wikipedia where a fuller account may be found. 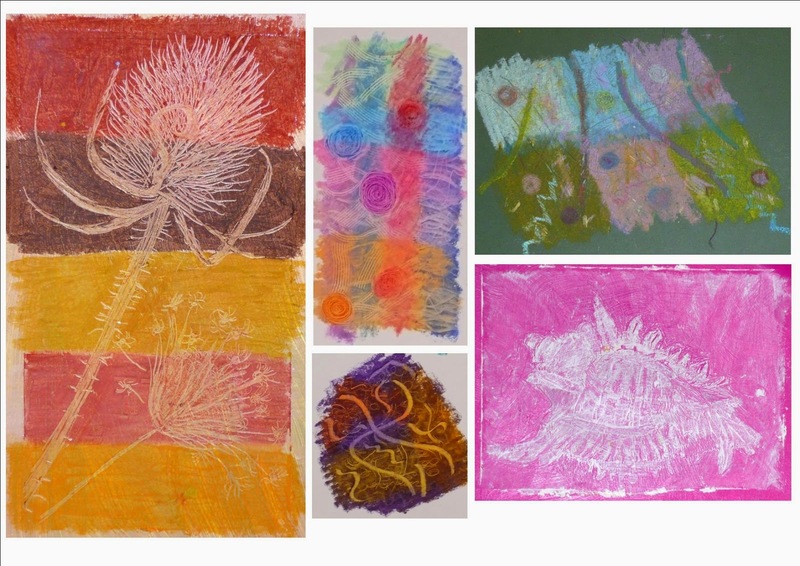 The photographs below are from a one day workshop held on February 14th at Norden Farm Centre for the Arts Maidenhead where we explored ways of working with this vibrant medium which can be blended, scratched into and is compatible with oil paint. Participants were encouraged to experiment with coloured and white paper and find ways of blending colours.